Once upon a time, a long, long time ago, there was a young sprout; “Rod” was his name. A series of things and events, including a paper planisphere, a pair of toy binoculars, and a look at—if not through—the 2-inch A.C. Gilbert telescope of a little girl named “Stephanie” conspired to make him think that, of all things, he wanted to be an astronomer. An amateur astronomer, at least. His Mama had her quirks, but she wanted the best for her somewhat odd duckling, and couldn’t help but notice he’d got awful starry-eyed of late. Despite the Smokey the Bear public service announcement running on TV that urged youngsters to stop looking up at satellites and stars in favor of keeping an eye to the ground and peeled for forest fires, Li’l Rod’s gaze was firmly locked on the heavens. And it was becoming apparent this was not just a passing phase like his short-lived craving for Gilbert’s chemistry sets. 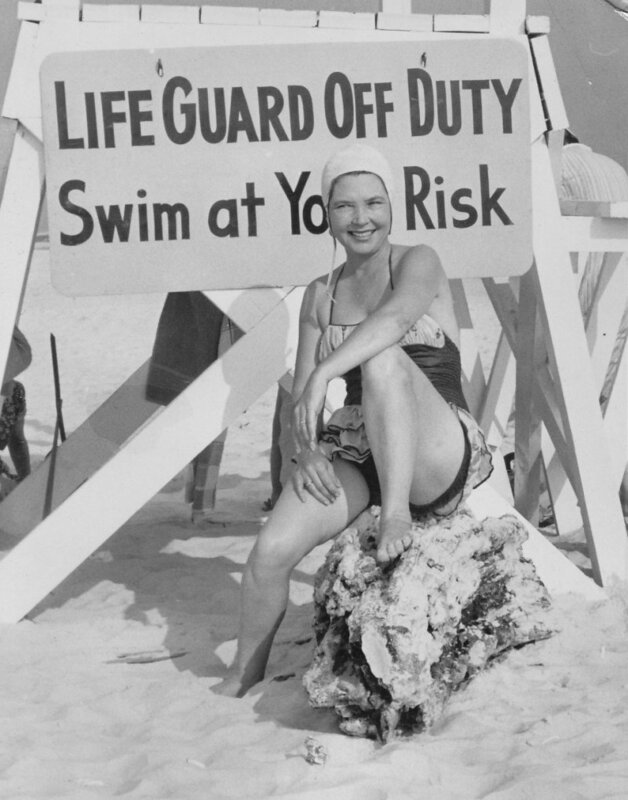 As the librarian at Rod’s elementary school, Kate Shepard, Mama received quite a few mailings from a subscription service advertising magazines, not all of which were aimed at or only at grade school kids. One afternoon, she showed the Rodster one she’d got for a periodical by the name of Sky and Telescope. 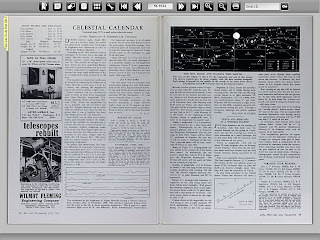 The text describing the magazine was brief, “Published by Harvard College Observatory. Astronomy,” but was doggoned descriptive enough: “astronomy,” “observatory,” “sky,” “telescope.” What the heck else did you need to know? Amazingly, or maybe not so amazingly, seeing as how she rarely said “no” to books and magazines I fancied (she did not like my fascination with Famous Monsters of Filmland), Mama turned to me and asked if I’d like a subscription to this astronomy magazine. It was expensive, six dollars a year, but she reckoned that if Daddy approved, it would be OK. What did I think? Oh, well, I’d have to think it over. NOT. I was hopping up and down. Mama did caution that some of the magazine offers that came across her desk were schools-only, and were not available to the general public. She’d write the Sky and Telescope folks (at Harvard College OBSERVATORY!) on Kate Shepard letterhead stationery and see if they might be willing to sign a little kid up for a subscription. Thus I entered in on an extended period of anticipation, an agony of anticipation; not just because I knew it would take a while for the first issue of any magazine you subscribed to to arrive, but because I was not at all sure those demigod-astronomers up north would find me worthy. Spring melted into a typically hot and lazy Gulf Coast summer, school let out for the year, and still there was no Sky and Telescope. Jitter and Wayne Lee had moved away, far away, with their folks as soon as school was over, due to the closing of our Brookley Air Force Base. I was devastated, and I wasn’t the only one. Those of us left behind in our little city sat and sweltered through an uncommonly hot summer. Seemed that way, anyhow. It was as if all the life had been sucked out of our town and us. There was nothing to do, nowhere to go, and nobody to go with if there had been. Yeah, I could still play army and spacemen and the ever-popular “Werewolf’s Out Tonight” with the kids next door, but somehow it just wasn’t the same. Or I could sit inside and look at TV if Mama would let me sit inside, which she wouldn’t. All she wanted to watch was her “stories,” the soap operas, anyway. I could ride my bike up to the swimming pool, but there were only so many hours even I was willing to stay submerged in chlorine. Mostly it was sitting under a tree with a comic book or a book. I especially favored the Fantastic Four’s comic magazine, but a twenty-page funnybook didn’t last long. 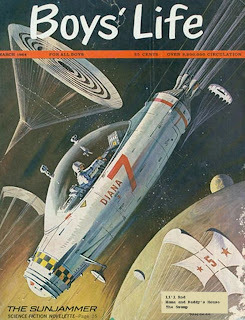 When the month’s issue was done, I turned to science fiction. Maybe an Asimov, a Clarke, or a Heinlein, or, if I hadn’t been able to get Mama to take me up to the library, which was way out of bike range, one of my Tom Swift Junior books. I seemed to get a Tom Swift or three from somebody every single birthday and Christmas, and while I was now probably on the high side age-wise for the updated tales of the boy inventor and scientific genius, I still loved them. 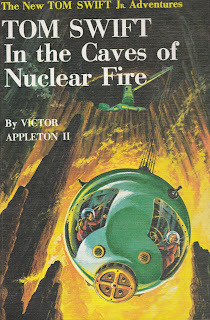 That summer I was particularly keen on Tom Swift in the Caves of Nuclear Fire and Tom Swift and the Asteroid Pirates. Sky and Telescope? After three months of fruitless waiting, I’d purty much decided “ain’t happening.” Actually, I had kinda forgot about it. Till one afternoon when, for want of anything better to do, I wandered out to the mailbox after noticing the flag was down. Inside was a Boys’ Life, which was a good thing. I’d started getting that prototypal American magazine when I’d joined the Cub Scouts, and, while I’d decided the Boy Scouts were not for me (I did like their Handbook), I still enjoyed the magazine and convinced Mama to continue to renew it. I didn’t pay too much attention to the rest of the mail I gathered up to take in—not at first. Hmm...big manila envelope. Probably one of Daddy’s radio magazines. Or...maybe… One glance at the return address changed everything: “Sky and Telescope,” a beautiful script “Sky” and Times New Roman “Telescope” accompanied by a little drawing of a big telescope. I could take a detailed stroll down memory lane with my first issue, July 1965, but that is not really the subject of this blog. Not completely. I will point out three things that have stayed green in memory over the intervening five decades. One is Questar’s full-page inside-front-cover advertisement. The ad’s text read, “A Questar…became the first high power telescope in a manned spacecraft when NASA, in its Gemini program, put the Molly Brown into orbit on March 23, 1965.” This was accompanied by a big photo of a gleaming Q3.5 with its tube partially cut away to reveal the inner workings. Man was I impressed. I was just mad for the space program and Project Gemini. Telescopes and space capsules: did it really get better than that? It did. Farther in, almost to the back of the magazine, was Walter Scott Houston’s July edition of his “Deep Sky Wonders” column, a tour of Hercules. Most of Mr. Houston’s targets were way beyond me. It wasn’t likely I was gonna be able to find a 12th magnitude galaxy, NGC 6207, from Mama and Daddy’s backyard with my Palomar Junior and Norton’s Star Atlas. I could, however, see M92 and M13, and Scotty’s friendly, uber-competent prose changed everything (I keep saying that, don’t I? ), helping me from the first to understand the deep sky objects I was looking at. Finally, there was the back cover advertisement, featuring the telescope that for years was for me the telescope, the Unitron 3-inch Photo Equatorial refractor with (the blurb below the picture trumpeted) MOTOR CLOCK DRIVE. If anybody had told me my humble Pal Junior 4.25-inch Newtonian was capable of showing as much or more of the sky than this beautiful f/16 achromat, I would have laughed in their face. I mean just look at the thing: cameras, guidescopes, dozens of eyepieces (it seemed like) in the rotary “Unihex” turret diagonal. Surely this Unitron Corvette would blow the doors off my Edmund Volkswagen. I know different now, but part of me still wants this Unitron every time I see its numinous picture. And I can see it again if I want. I was able to hang on to most (though not all) of my early issues of S&T despite the depredations of ex-wives. But who wants to schlep upstairs to Chaos Manor South’s Massive Equipment Vault and rummage through the disorganized and dangerously tilting stacks of old astronomy magazines? Not moi. But I am able to refresh my memory of July 1965 anyway. Not that I need to, of course; those pages are locked in my mind forever. Still, it’s nice to page through the real magazine once in a while, or at least the virtual magazine. God knows, being an astronomy writer is not an overly remunerative proposition. You do get a few bucks here and there, and you get the chance to travel to some interesting star parties on somebody else’s dime and meet some nice people and their nice telescopes. No, it ain’t like you’re gonna be keeping company with Stephen King, but, yeah, there are a few perks. Like the set of Sky and Telescope DVDs that appeared on my porch the other p.m. thanks to the kindness of the folks at the magazine. What DVDs? Why, the DVDs containing the entire print run of Sky and Telescope from the first issue in November 1941 to this past year’s, 2009’s, November number. The Complete Sky and Telescope. Which has, been, I gotta admit, a dream of mine for a long time. 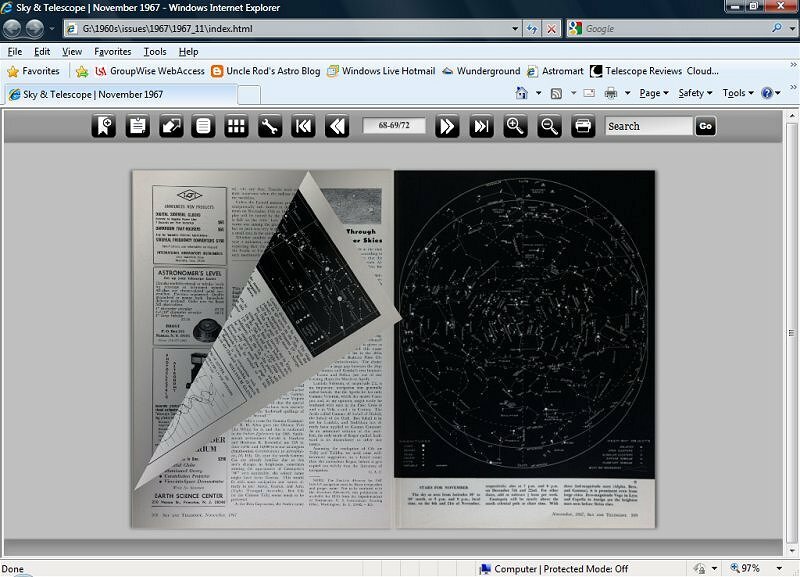 Thirty years ago, I hoped for Sky and Telescope on microfilm (younguns: don’t ask). Twenty years ago, I wished for microfiche (same-same, youngsters). Ten years ago, I longed for ‘em on CD (yeah, that would’ve been a lotta CDs). But the time just wasn’t right, I reckon. I wasn’t the only one who wanted all the issues in an accessible form, but no matter how we clamored for it, it didn’t happen. For quite a while, as I understand it, there was a legal roadblock to electronifying some of the issues. Earlier this year the word began to spread that that roadblock has been moved aside, and IT WAS GONNA HAPPEN. I’d read some brief semi-reviews of The Complete Sky and Telescope from people who’d already received their sets, but it still just didn’t seem possible. All of those hallowed issues in that pretty little box? Yep, all of them. All of Scotty’s columns. All of those glorious telescope ads. All of the sixties and seventies issues I’d lost. All of the sixties and fifties and forties magazines I’d never seen. That was the dream, but dreams can die, they say. I wasn’t too paranoid, though. I’d been impressed by Sky and Telescope’s digital editions of the current issues. To be frank, I’ve actually come to prefer reading the magazine on the computer. 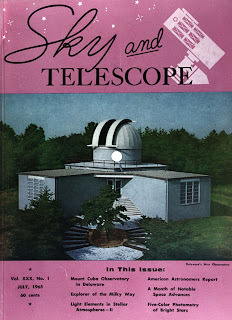 I expected the production values of The Complete Sky and Telescope would as similar as possible, given the ancient source material, to those of the modern-day digital magazine, which would be great. Only a look at the disks would tell the tale, though. The set is arranged by decades, with each ten years, from the 40s – the oughts, getting its own DVD or DVDs. With trembling hands, I inserted “The Sixties” (natch) into my Windows PC’s DVD drive. After a short, not at all annoying wait, an autorun file on the DVD delivered the index screen you see here. On the left is a list of highlights for the decade, “Photographs of Comet Ikeya Seki,” for example. Clicking that took me straight to the issue it appeared in, to the cover of that issue, at least, but not to the article itself. There’s also a search button to the right of the “year” buttons. Pushing that brings up a “find” dialog that searches all the decade’s issues. I already knew which year I wanted, 1965. The month, too—July, of course. Clicking the year of interest in the menu bar at the top of the screen summons an image of that year’s first issue, January for all but 1941, and an array of vertical buttons labeled with the months. Pushing a month button displays the cover of that issue. To its right is a (non clickable) table of contents. And, after a surprisingly short wait, only ten seconds with my somewhat elderly Vista PC and DVD drive, there it was. July. Looking pretty, much as it had the afternoon I pulled it out of the big, brown envelope. But how to work the thing? What’s the reader like? What else can you do with the reader? Most importantly, you can zoom. The image look good, but, since the reader normally displays two whole pages, the words are too small to read. There are two ways to blow ‘em up. On the toolbar are zoom and unzoom icons. Push the zoom-in button and you can zoom-in until a single letter of text occupies the whole screen. What I found most efficacious, however, was the automatic zoom function. Click anywhere on the page and it is instantly enlarged to a size perfect for easy reading. When zoomed-in, you’ll have to move around the page, since only a portion of it will be visible at any one time. You can either drag the page with an Acrobat-like hand tool or mouse over one of the four direction arrows on the page borders. Lessee, what else? There’s a full-screen button. Pushing it causes the reader to occupy all the screen real-estate, hiding the Windows menubar and stuff. “Contents” brings up the clickable TOC you see here (there are no hyperlinks or other clickables in the issues). Mashing the thumbnail icon—all the icons are readily identifiable and all have “balloon” labels—brings up a horizontal row of thumbnails of the issue’s pages at the bottom of the screen. Text is utterly illegible, but the pictures are decipherable. There’s also “tools,” which allows you to enable sound, a page flipping sound, or start a slideshow of the issue on display. The slideshow worked well, but I couldn’t get sound to do pea-turkey. Next over are the page-control buttons. Forward, reverse, go to the first page, go to the last page. There’s also a small window dead center in the toolbar that shows the numbers of the two pages currently displayed and the total pages in the loaded issue. Type a page number in there and hit Return, and you’ll go right to that page. Last up, after the aforementioned zoom and unzoom buttons, are a print button and a search window. Both print and search work well. “Print” gives the options of printing either the left or right displayed page, or printing a series of pages by their numbers—you know, 1 – 10, etc. Search is really cool. Typing something there—I typed-in “telescope” for fun—brings up a window with the hits. Not only is the returned text displayed, so is a thumbnail of the page it’s on, and clicking that thumbnail takes you directly to the page. Swift, real swift. It’s not likely you’ll get confused about what the simple toolbar icons do, but if you ever should, help is close at hand, if not in overly detailed fashion. 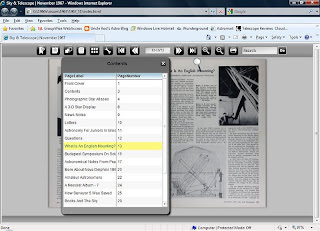 Returning to the cover page via the “go to first page” button displays an icon reference window to the left of the issue’s cover. Do note that two of the icons listed on this help window do not actually appear in the toolbar, namely, “E-mail to a friend” and “Download a copy in pdf format.” The “why” of that is security, I presume, and that is understandable. While I’d like to think otherwise, you and I know good and well somebody would soon be sending pdf files of the issues flying all over the Internet if this were an available option. What is the format, by the way, if it’s not Acrobat .pdf? Several types of files are involved, but basically what the issues are is Adobe Flash documents. I would have preferred Adobe Acrobat, I reckon, as it’s more portable; I can do stuff like read pdfs on my iPod. I can live without that, I suppose. While maybe not as versatile as pdfs, the discs can be used on most computers, including the Macintosh. What’s important to me is not the format of the files, anyway, but how legible, how clear, they are. I will not make y’all sweat. Every issue I’ve looked at has been easy to read, though, naturally, some are better than others because some of the source material was better. Don’t judge the clarity of the magazines by the small screen shots here. The only way to grab a picture from the reader that I can see is with alt-print-screen and that yields small, fuzzy shots. The actual images are clear enough that I can actually read them without my glasses (!). I have seen comments on the Internet that “contrast isn’t high enough;” that the text is not deep black and the pages are not bright white. That’s true, but that is a good thing in my opinion. Stark black on white would be very tiring to read. I am glad the folks who imaged the issues left them like this. Color (the interiors of the first three decades are all black and white, of course) looks good and true to the real issues. The bottom line is these virtual mags are both readable and pleasant to read. The same goes for pages printed from the disks. No, they do not look as fresh and crisp as the magazine I pulled from the envelope on that long-ago summer afternoon, but are more than useable. “But what good is it, Uncle Rod? What good is it, huh?” Why should you spend your hard earned money in an amount about equal to the cost of a good mid-grade eyepiece for these DVDs? There are many reasons. There is a wealth of knowledge here. Not just about the science of astronomy or the evolution of the science of astronomy over the last seven decades, but about you and me, about amateur astronomy. Not just the practice of amateur astronomy, what we looked at, but the gear we looked at it with. 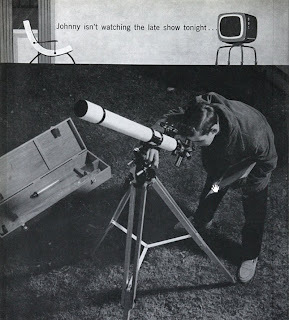 If you are an astronomy gearhead, the ads alone are worth the price of admission. Me? It’s a godsend for an astronomy writer. I’ve already found the set useful for research. Useful? More like “indispensible.” I’ve always referred to Sky and Telescope, but that meant attacking those musty back numbers—after figuring out which issue the material I was after was in, which wasn’t always easy. 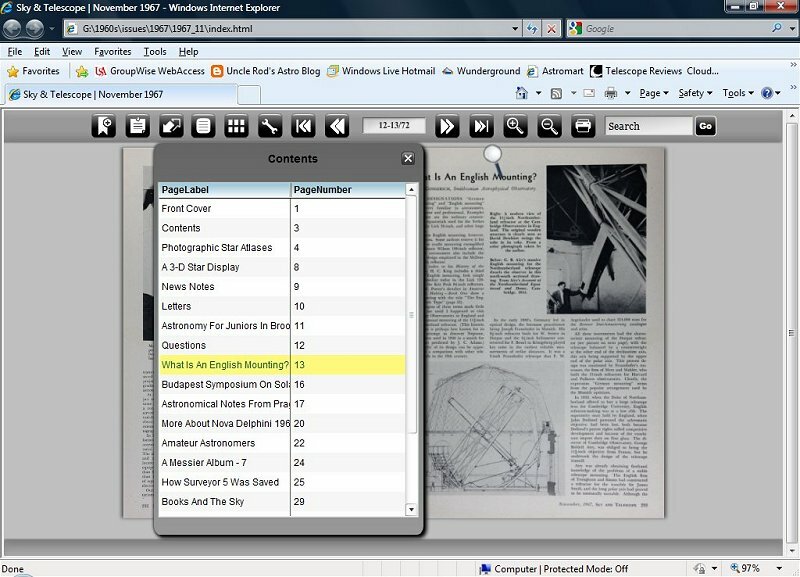 Yes, Sky and Telescope has had an online index for some years, but it’s easier still to use the search tools the DVD set provides. As I done mentioned, you can search within an issue. Or you can search a whole decade’s issues. But what if you don’t even know which decade your quarry is hiding in? You’ll notice this “Seven Decades of Sky and Telescope” set actually includes eight DVD cases (eleven DVDs; the last three decades are on two disks each). The extra is the “search disk,” and will bring back results for any issue in any decade. When you know what you want, you must remove the index DVD and insert the “decade” DVD, but that is still one hell of a lot easier for me than dragging my carcass upstairs and tackling The Stacks. Yeah, the DVD set is very valuable for serious work, but who am I kidding? As useful as the DVDs are, a large part of the attraction for me is good, old nostalgia. Looking at the old Unitron ad showing a little boy out with his scope, ignoring the late show for the heavens, I can almost see myself in that picture and it all comes flooding back. If you’re a youngun, this is a mite hard to understand, but wait until your 50s threaten to segue into your 60s, and then you will get it. Verdict? Do I need to spell it out for y’all? OK, I will: two enthusiastic thumbs up for The Complete Sky and Telescope. I don’t care if you have to eat Vye-enner sausage for a month of lunches to get the price of admission together, muchachos, just get it. You will thank me later and apologize in most abject fashion if you doubted your Old Uncle. Need more inducement? If you order soon, you’ll get a sweet little bonus, a facsimile copy of the first issue, November 1941. Mine now occupies a spot of honor on the coffee table in Chaos Manor South’s front parlor. OK, youngsters—and not so youngsters—we left off last time with telescope mounts, considering the choice of fork vice GEM vice alt-az. I hope you made up your mind about what kind of mounting you want your scope to ride on, cause you will need a mount now, as we are gonna pick you a telescope. Which can be scary. It’s not likely you’ll keep your initial telescope for the rest of your observing career; you will probably want More Better Gooder sooner or later, but you do want your first telescope to be something you can use for a while and which will show you plenty of cool stuff. Complicated choice? A little, but it really boils down to just this: reflector or refractor. There are plenty of subcategories, but there are only two basic kinds of telescope, ones that use mirrors to collect light, and ones that use lenses to collect light, If you are confused already, if’n you ain’t read a basic book on telescopes yet, I suggest you stop rat cheer and do so now. Which book? My time-honored selection is Sam Brown’s All About Telescopes. No, it ain’t modern, and it ain’t gonna educate you about go-to, but you don’t need that at the moment. It will tell you everything you need to know about scope basics—mirrors, lenses, focal length, focal ratio, and all the rest of that forbidding stuff. Go do some book-reading. I will wait. Hokay, you now know the basics. You know the prime function of a telescope is to gather light. That any telescope can, with the proper eyepiece, magnify as much or as little as you want, but that gathering that light is the important thing. 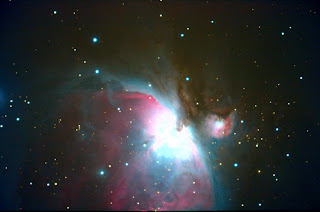 You know shorter focal length telescopes produce wider fields and lower powers eyepiece-for-eyepiece than longer ones. You know that aperture-for-aperture “fast” focal ratio telescopes, telescopes with low focal ratio numbers, have shorter focal lengths than “slow” ones with higher focal ratio numbers. A slow scope is usually considered to be one with a focal ratio higher than about f/10. A medium is around f/6 – f/8, and a fast one is f/5 and below. If you have glommed onto these few facts, you really know all the telescope theory you need to get started. If nuttin’ else, a refracting telescope at least looks like a telescope. Beyond that, refractors offer some real advantages. Beginning with an eyepiece viewing position that is comfortable and convenient. Larger Newtonian reflectors will require you to stand to observe, maybe on a ladder. The eyepiece of even sizeable refractors is at the rear end of the tube, and it’s usually possible to sit and observe no matter where you are pointed in the sky. Aside from comfort, refractors offer two pluses: lack of required maintenance and more efficient, better performing optics. If you own a Newtonian reflector, you will eventually, if not constantly, be faced with two maintenance tasks: keeping the optics clean and keeping the optics aligned (collimated). The Newtonian’s open tube allows its two optical elements, the primary mirror (the big one at the bottom of the tube) and the secondary mirror (the little one at the top) to be exposed to the air. Eventually, they will get dirty and require cleaning, a delicate task if damage is to be avoided. After a while, they will have to be sent out for recoating, re-aluminizing. A refractor’s single optical element, the big objective lens, is not prone to degradation and will require only gentle cleaning, an easy process compared to cleaning a mirror. 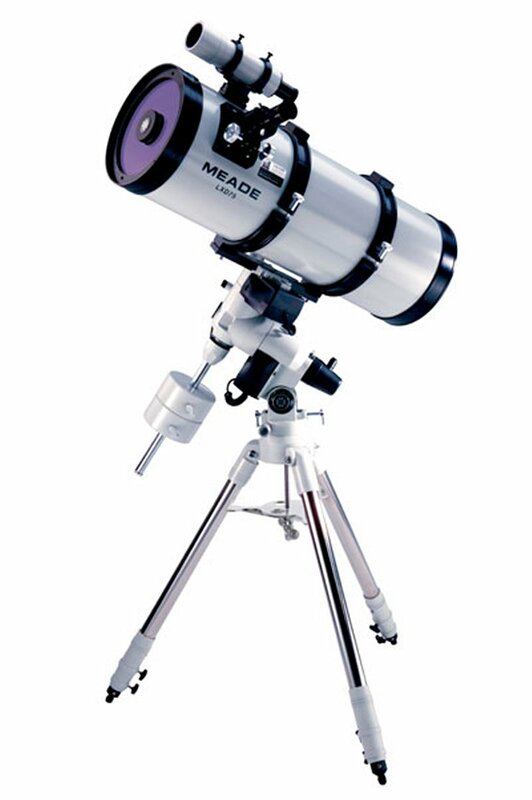 Almost any type of reflecting telescope will need to be collimated regularly-to-occasionally. In fact, larger truss-tube type Newtonians may need to have their optics realigned before every use. Refractors? Their optics rarely—if ever—need adjustment. There’s also the quality factor. 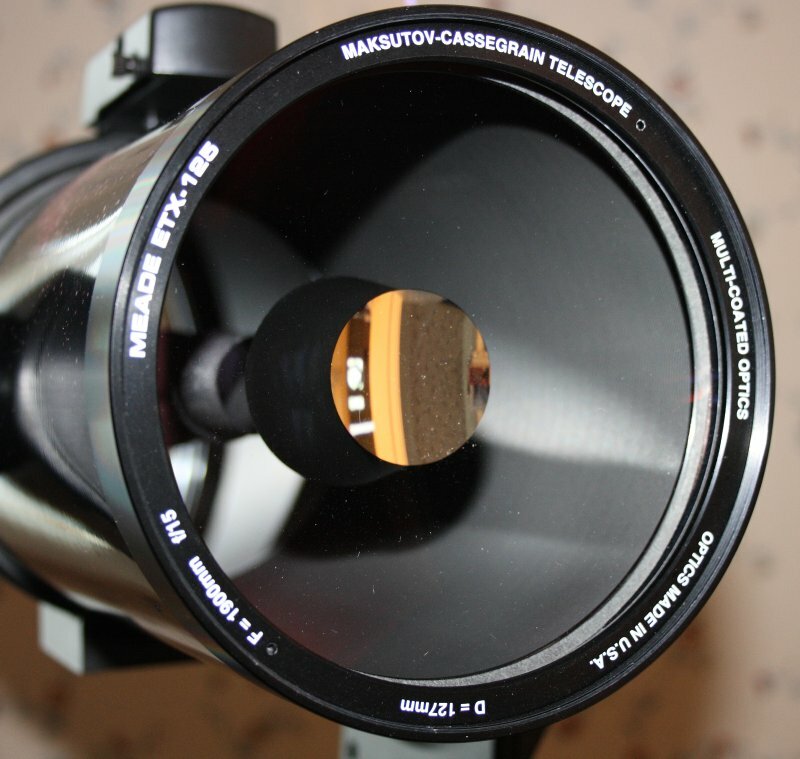 Most reflecting type telescopes need a secondary mirror to divert images to the eyepiece for looking. This mirror, placed in the light-path, doesn’t do too much to reduce the brightness of objects, but it can and does diminish contrast. How much? That depends on the telescope in question, but it will always be “some.” The refractor has no obstruction and is thus able to deliver the best images its objective lens is capable of producing. Add to those pluses the fact that even large refractors can be ready for critical viewing almost immediately. Reflectors need to adjust to outdoor temperatures before they can deliver their best images. In contrast, while larger refractors may need a little while to acclimate to the outdoors, it’s a quick process compared to a reflector’s “cooldown. That’s why small-medium size lens scopes, especially, make such superb spur-of-the-moment-observing “grab ‘n go” telescopes. As you may have heard, and if you haven’t, I’ll tell you right now, no telescope is perfect. Refractors suffer from two major deficiencies: lack of light gathering power and either cost or chromatic aberration. What’s important in a telescope? Its ability to collect light from distant objects. The size of its lens or mirror determines how many faint fuzzies in the Great Out There you will see and how much detail you will see in them. On the planets, light is important as well, as the eye has an easier time making out bright details. The size of the objective or mirror also determines the telescope’s resolving power, how small a detail it is capable of revealing. Again, bigger is better. An 8-inch reflector is a common, inexpensive telescope. 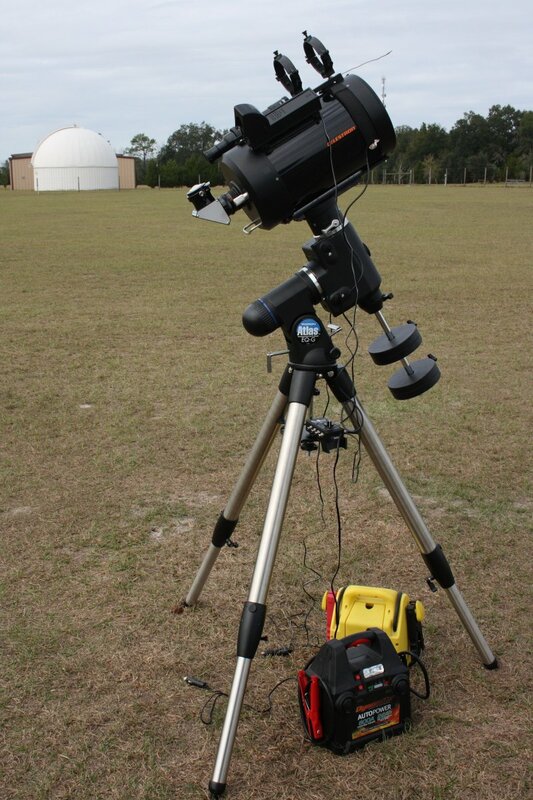 An 8-inch refractor is a huge and seldom seen instrument due to size and cost. “Even” a six-inch refractor, even one of fairly short focal length, is a large and heavy telescope. Much heavier than a comparable reflector. That doesn’t just mean it’s more of a pain to carry around; it means a heavier duty mount is needed to support the telescope adequately. A shaky telescope is an annoying telescope; really no telescope at all, as you’ll soon get tired of your objects dancing all over the eyepiece. Not only is a larger refractor heavier than a comparable reflector, it is either very expensive, or possessed of a bad optical problem, chromatic aberration. 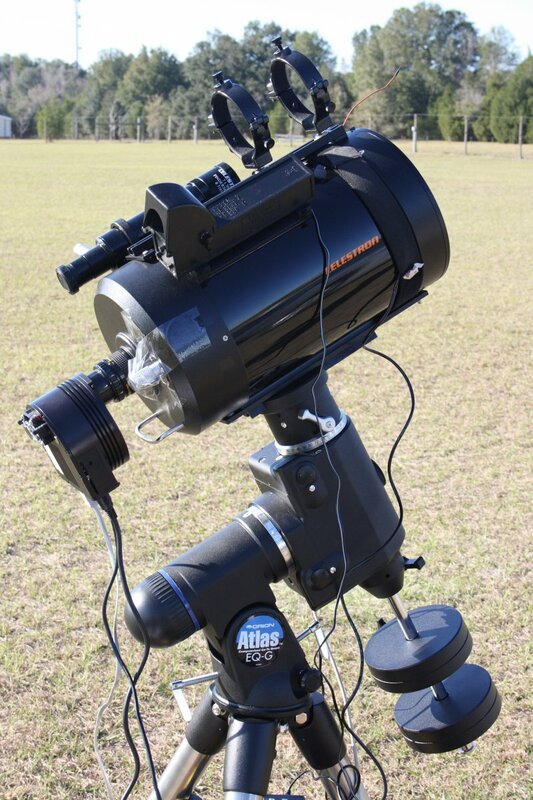 You can get a reasonably priced 4 – 5 – 6-inch refractor (though it will still be more expensive than a reflector of equal aperture). The catch is that you may not like its images. 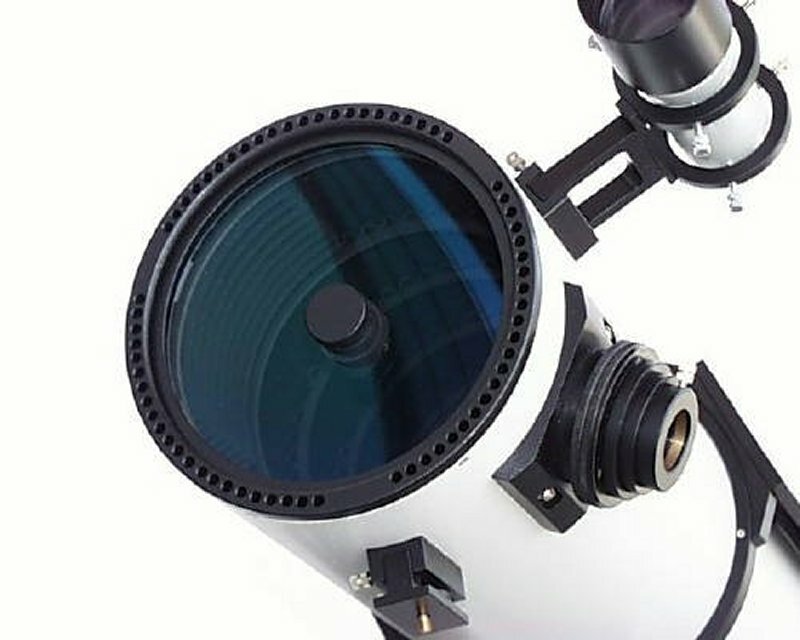 The least expensive astronomical refractors are usually achromats, whose objectives are simple lenses made from two “elements” of different types of glass, crown glass and flint glass. Early refractors had even simpler single element lenses, lenses made of a single piece of glass. And that was not a good thing. Due to the light-refracting properties of a lens, all the rays of light from a celestial object do not reach focus at the same point, with the focus points of blue and red rays being significantly different. For that reason, the in-focus image of a single-element objective looks like something you’d see in a kaleidoscope. Any bright object will be surrounded by a glaring purple halo. The color purple can be reduced by the use of an achromatic objective. This type of lens, patented by John Dolland in 1758, is, as above, composed of two elements, two separate pieces of glass. Two types of glass with different refractive properties; they bend light rays differently. This can lessen, if usually not eliminate, chromatic aberration. Unfortunately, the achromatic objective can only do its best job at high focal ratios, with a 6-inch needing to be at f/20 before color really becomes unnoticeable. That means a 6-inch telescope will need a tube ten feet long for good color correction. Chromatic aberration increases with the diameter of the objective lens, but even a 3-inch glass (of reasonable focal length) will show considerable color on the Moon, the bright planets, and bright stars. ‘Course, I often hear achromat lovers say, “Unk, the color really doesn’t bother me.” OK, B-U-T. The major benefits of a refractor, perfectly sharp high-contrast images, are somewhat lacking in manageable tube-length achromats. Chromatic aberration, you see, doesn’t just throw up ugly purple rings around everything; it steals sharpness and reduces contrast. If all there were to the refractor story was achromats, the design would have likely died out for serious use due to chromatic aberration. By the end of the 20th century, however, that nut had been cracked. It turned out it was possible to produce color free refractors by using lens elements made of exotic glass, including fluorite crystal. These telescopes, perfected by Takahashi in Japan and TeleVue and Astro-Physics in the United States, literally saved the refractor from the dust bin of history. Since, with no color problems to worry about, they could be made in fast focal ratios with resultantly short focal lengths, “APOs” became renowned as photographic instruments and are favored today by many imagers. There is always that catch, though, ain’t there? The catch is cost. APOs are expensive to do well. Their lenses have to be just right to eliminate color, and it often takes three lens elements to do the job. For that reason, a 6-inch can cost ten-thousand dollars or more. It will be a fine instrument, but—and here is the rest of the catch—visually its images will not be worlds different from those produced by a 6-inch Newtonian costing three-hundred dollars. Oh, they will likely be better, sharper if not noticeably brighter, but thousands and thousands of dollars better? Despite my pronouncement that “there are no perfect telescopes,” the Newtonian’s (named for its inventor, Sir Isaac, natch) fans will tell you it are one. It makes up for the refractor’s deficiencies without falling prey to many itself. It’s surprisingly cheap in large apertures. Even the least expensive examples do not suffer from chromatic aberration, and it is reasonably light and forgiving of mounts. And all of that is true, which is one reason the Newtonian was for decades the most popular telescope for amateur astronomers. 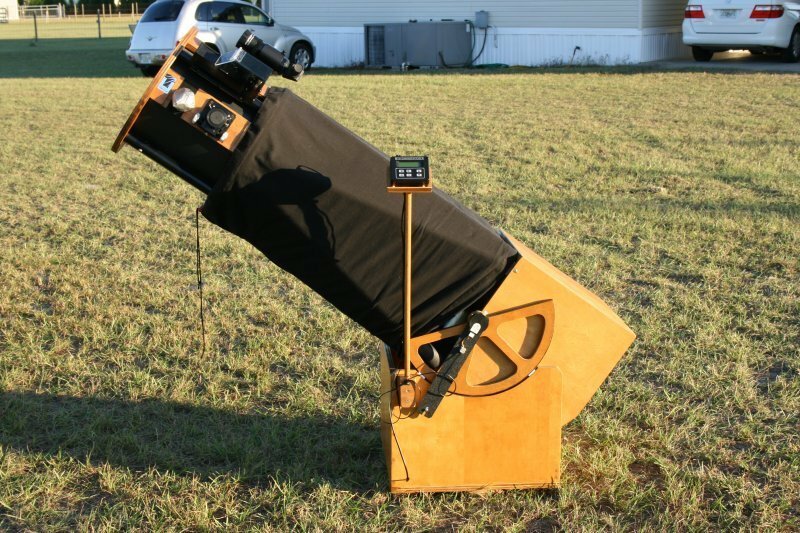 It is still the most popular home-built telescope design, and, in Dobsonian form, it’s probably just behind CATs in the commercial telescope popularity contest. For years and years, from the 1920s till the 1970s, at least, the “standard” amateur telescope was the 6-inch f/8 Newtonian. The “Newt” is a simple beast with not much to go wrong. Take a mirror, place it at the bottom of the telescope tube. Arrange a flat mirror canted at a 45 degree angle at the other end of the tube. Light comes in, hits the primary mirror, gets diverted out the side of the tube by the secondary mirror to a focuser and eyepiece, and that is it. No wonder the Newt’s always been the darling of ATMs, amateur telescope makers. Yeah, the hordes of Newtonian loyalists will tell you it is the perfect telescope, but when you pin ‘em down even they will admit it ain’t quite that. There are always the “buts.” Starting with the optics. No, there’s no chromatic aberration, but escaping that demands tradeoffs. Starting with the secondary mirror. As I tole y’all in the refractor section, placing that in the light path does do some harm, reducing contrast. If the secondary is kept as small as possible (nothing close to 100% field illumination is needed for visual observing), the damage can be kept to a minimum, though. Replacing the lens with a mirror does away with chromatic aberration, but it causes another problem. In any but the highest focal ratios (about f/10 for a 6-inch), the mirror must be parabolized; it must have a slightly deeper curve than a sphere, a parabola. Fail to do that and the telescope will suffer from the same problem the Hubble did when it was first launched: light rays from the edge of the mirror will focus at a different distance than those from the center. Resulting in lousy, fuzzy images. The solution for this problem, spherical aberration, is to use a parabolic mirror. But there is no such thing as a free lunch. As parabolic mirrors get faster, go below focal ratios of about f/5, a problem inherent in all paraboloids becomes ever more troubling. That problem is coma, which results in stars at the edge of the field looking fuzzy no matter how the telescope is focused. There are workarounds. Using medium apparent-field-size eyepieces makes coma less obvious. But we all want Naglers and Ethoses and that “spacewalk” experience Al Nagler is always going on about, don’t we? The ultimate solution is an auxiliary lens/lens set before the eyepiece, a “coma corrector.” That adds expense and has its own tradeoffs. Me? I just pay more attention to the field center than the edge. Then there is collimation, adjusting the aim of the Newtonian’s two mirrors so they are properly aligned with each other. Many beginners fear and obsess over collimation, and it is true that a miscollimated scope will yield images from the not-so-hot to the yucky depending on how far off it is. With the proper tools, though, Newtonian collimation is not difficult as long as you keep the big picture in mind and don’t overcomplicate the process. Finally, there’s the body, the tube. Like the refractor, a Newtonian’s tube will need to be about as long as its focal length. This is maybe less a problem with the Newt than it is with the achromatic refractor, since inexpensive Newtonians are available in fast focal ratios that result in shorter focal lengths and shorter tubes. Be prepared to invest in a coma corrector if you go “below” f/5, of course. What’s a Dobsonian? 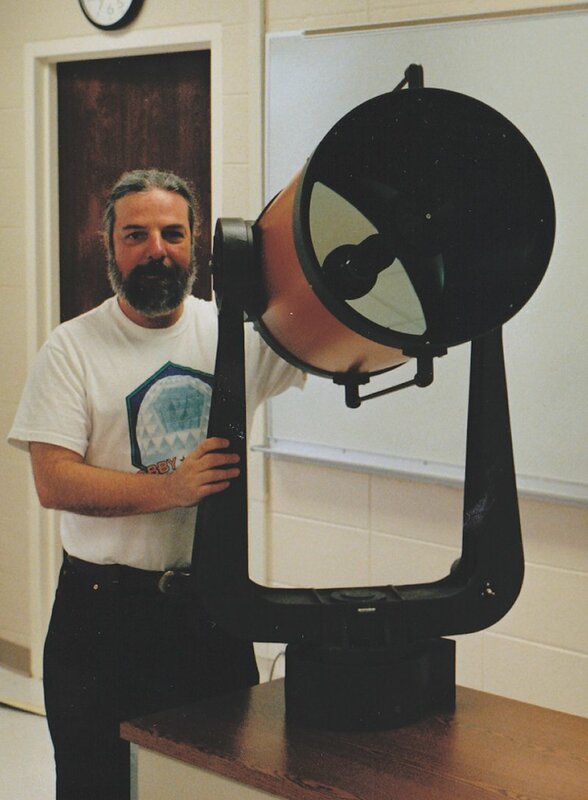 John Dobson’s pet telescope is nothing more complicated than a Newtonian on a simple alt-azimuth mount. All the pluses and minuses of any Newtonian go for any Dobsonian, too. There is one complication, though. To make the larger Dobsonians portable, their makers do not use solid tubes, but a collapsible “truss” tube structure made of small diameter aluminum tubing (usually). This is cool, and can allow you to get a surprisingly large telescope in a surprisingly small car. Most truss tubes, however, won’t go back together precisely the way they were before you took ‘em apart, meaning you will have to at least tweak collimation every time you reassemble the scope. 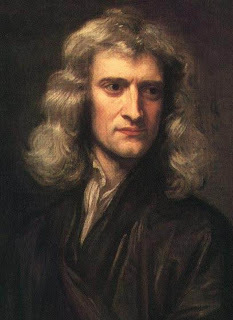 Dobsonians, by the way, have probably become the dominant type of Newtonian. Chinese telescope makers have done yeoman duty in reintroducing the equatorially mounted Newt to American amateurs, but most of us probably still want a Dob when we want a Newt. It’s easy to see why. The Dobsonian is about as simple and steady (when properly made) as it’s possible to make a telescope. This is due to the intuitive up/down left right operation of its alt-azimuth mount, and the large bearing surfaces (made from Formica riding on Teflon pads), and the vibration-absorbing wood most are made of. It’s, frankly, quite possible there wouldn’t be many Newts around today, commercial ones, anyhow, if not for the Dobsonian revolution. “Catadioptric” dern sure is a five-dollar word, but its meaning is easy to understand: a catadioptric is a telescope that uses both lenses and mirror to form images. Yeah, I know, refractor owners often add a mirror to their telescopes, the diagonal, but that is to make viewing more comfortable. In a “CAT” both lenses and mirrors are required for the telescope to produce good images. Sounds safe enough, but no telescope has been as controversial as the CAT, especially in its SCT variant. Which is not surprising. 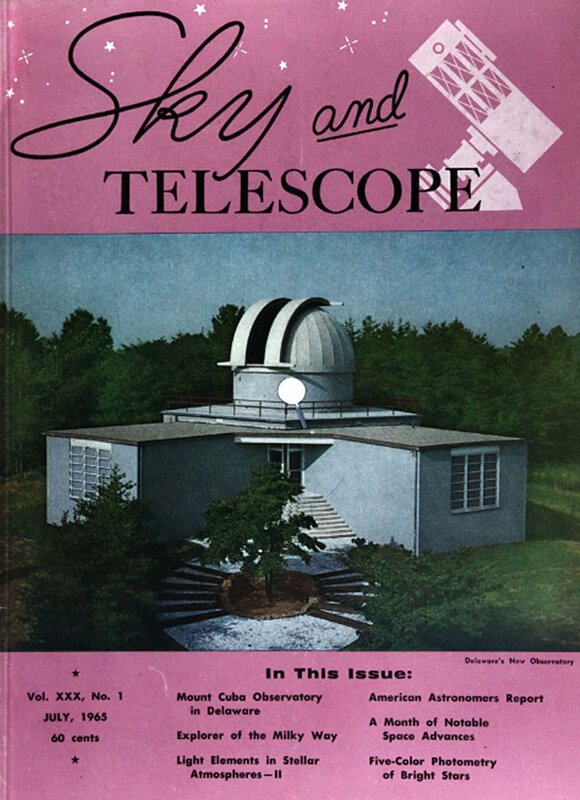 It long ago became the dominant commercially made telescope, with two large (for amateur astronomy) companies touting its superiority with full-page ads in the astro mags every single month for years. Naturally, that has rubbed some folks the wrong way and has led to backlash. Be that as it may. While CATs have some strikes against ‘em, as even their most rabid fans will admit, they also have some powerful strengths. The SCT is not the only CAT; there are three other commonly available types. All are similar, though. The SCT in particular? It is based on Bernhard Schmidt’s design for a wide field camera. 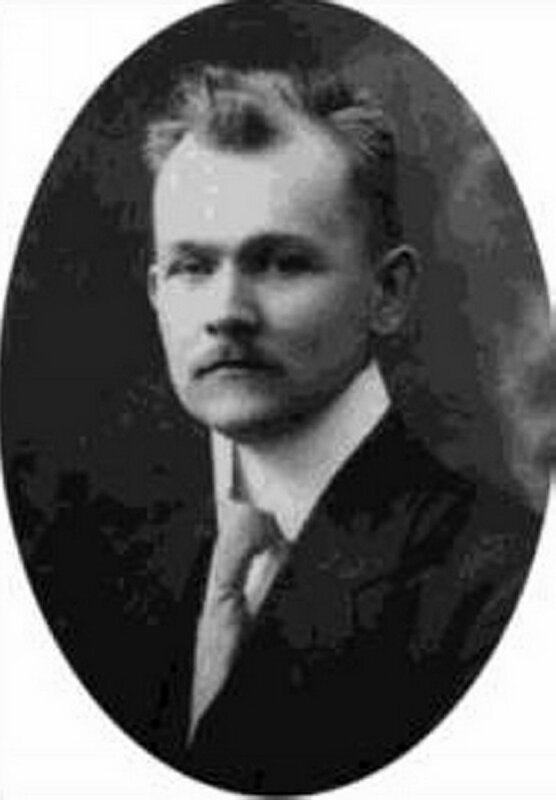 The prime innovation in Schmidt’s design was that it used an easy to make spherical primary mirror. Yes, there would be spherical aberration, but that would be taken care of by a special lens, the corrector on the front of the tube, that introduces enough “negative” spherical aberration to eliminate the “positive” spherical aberration in the primary mirror. All the members of the CAT family make use of this simple—if not so easy to implement—idea. The SCT is the CAT most of us are most familiar with, and it encapsulates the strengths and weakness of the breed for both users and makers. It’s no wonder it’s so popular and that we’ve got two sizeable companies producing what would seem to be a rather specialized telescope. The pluses for the manufacturers? The telescopes are easy to make in a mass production setting with a minimum of human intervention required. The spherical mirror is much easier to do than the parabolic primary of the Newtonian, and, in an industrial setting, even the complex-curve corrector lens can be easily mass produced. The other part of the Schmidt Cassegrain equation, the Cassegrain part, means these telescopes display real advantages for you and me, too. In addition to the primary and corrector, there’s a third part of the SCT optical system, the secondary mirror. This is a convex mirror that does two things: it directs the light/images from the primary mirror back down the tube an out through a central hole in the primary (the hole is in the shadow of the secondary, so no light gathering power is lost) for enlargement by an eyepiece. The convex, and thus magnifying, secondary (usually 5x) also slows down the fast focal ratio, usually f/2, primary to something more useful, usually f/10. As you can see in the diagram above, the SCT’s light path is folded. When you combine the magnifying power of the secondary mirror with this folded light path, the tube of an 8-inch SCT, which would normally have to be over six feet long, is less than two feet in length. 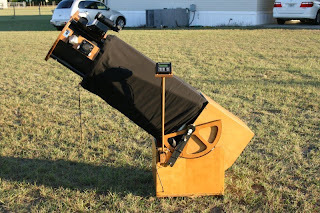 That makes the telescope very portable and very easy to mount and very steady on any even marginally adequate mounting. There’s one other big draw, the SCT’s focusing method. Both Schmidt Cassegrain makers focus their scopes not by moving the eyepiece in and out, but by moving the primary mirror back and forth. Not only is anything you want to mount on the scope, a camera, a big eyepiece, a spectrograph, whatever, very sturdily mounted on the rear cell of the telescope and free of flexure since it does not have to move to focus, the moving mirror yields a huge focus range; almost any camera or anything else can be brought to focus on an SCT. Finally, the rear eyepiece position makes the telescope easy to balance and comfortable to use. You can sit and observe with almost any SCT setup, just like a refractor, meaning you see more. If you are not standing and swaying at the top of a ladder, it’s easier to see everything the scope can show. Course it ain’t all hearts and flowers. As the SCT’s critics will point out, all this goodness comes at a cost. The corrector is easy to make in an industrial setting, but maybe not so easy to make perfectly. Usually, images will be just slightly better in a comparable aperture (mirror size) Newtonian. There’s also that wonderful secondary mirror of the SCT. In the designs essayed by Meade and Celestron, it must be fairly large in diameter. Almost always slightly larger than the secondary of a Newtonian. If the Newt secondary reduces contrast, the SCT secondary reduces it a bit more. There’s also the SCT focus method. Theoretically, there’s no reason it can’t work perfectly. However, in order to keep costs down, Meade’s and Celestron’s tolerances are fairly large. That causes the mirror to move slightly as it is pushed up and down to focus. Which causes images to move, to shift, slightly in the eyepiece. If the telescope changes attitude radically, as when crossing the Local Meridian, the mirror can move, flop, a little bit, also causing images to move in the field, which can be a problem for imagers. Neither mirror flop or focus shift is a show stopper, but they are annoying. Finally, there’s cost. Yes, Meade and Celestron have managed to keep their scopes amazingly inexpensive, but the least expensive SCT will always be more expensive than the least expensive (comparable quality) Newtonian. Collimation woes? Some users are fearful of attempting to collimate their SCTs, but it is a remarkably easy procedure—at least when compared to collimating a Newtonian. The SCT only has one user-adjustable optic, the secondary mirror. The MCT is almost identical to the SCT, but its fans will tell you the “Mak” at least has the potential for being optically superior to the SCT. Why? Mainly because of the corrector. Unlike the SCT’s complex curve, the MCT corrector is usually an easy to make sphere. That means it is really easier to do one very well than it is to do a complex SCT corrector very well. The native focal length of MCT primary mirrors is usually kept higher than that of the SCT, too, usually around f/3. That allows the secondary mirror to be somewhat smaller, helping with contrast. Downchecks? The main one is price. The “deep dish” MCT corrector requires a sizeable blank of very good glass, much thicker and heavier than the blank for the SCT’s window-glass thin lens. That is not a huge problem until you go larger than six - seven inches. When you do, the price of the glass and the price of the MCT skyrockets. The optimized MCT is also a slow system. Most Maks come in at a final focal ratio of around f/15. That is fine, and is just as good for observing the deep sky as any other design—as long as the targets to be observed are not too large. Even with focal reducers, wide field eyepieces, and long eyepiece focal lengths, there is a limit to how wide you can go with a Maksutov Cassegrain. Commercially made MCTs rarely—if ever—require collimation. “Gregory” style MCTs, anyway. A Gregory design Mak has a secondary that is not separate from the corrector; it is a silvered (aluminized, actually) spot on that lens. These telescopes can often be collimated by adjusting the tilt of the primary mirror, but that is really a job for an optician with an optical bench. There is another variant of the MCT, the “Rumak,” that has a separate secondary mirror in a corrector-mounted holder, just like an SCT. These telescopes are collimated just like SCTs. What if you were to combine a Maksutov and a Newtonian instead of a Maksutov and a Cassegrain? You’d have an MNT. The mirror at the bottom of the tube, the primary, is a sphere just as in the other CATs. And there is a meniscus shaped spherical corrector at the other end of the tube, just like in the MCT. The difference is the secondary. Rather than a magnifying convex mirror as in the MCT (and SCT), there’s a flat Newtonian style secondary that diverts light/images out the side of the tube just as in Sir Isaac’s design. The MNT design has been around for a while and was quite popular in the 1990s. It offers the advantage of medium-fast focal ratios and a small secondary obstruction. Since there is no magnifying secondary, what you see is what you get. The final focal ratio of the scope is the native focal ratio of the primary mirror. Which is usually about f/6. That gives the MCT a nice, medium-wide field, and also allows the secondary to be kept small, ensuring good contrast. Tradeoffs? The small secondary used in most MNTs doesn’t allow anything approaching 100% field illumination, and while that is not a problem for visual use, it can be a problem for imaging, with light-falloff giving the effect of looking through a porthole. That can be fixed in digital processing, to some extent anyway, but it is a consideration. Anything else? The long tubes—compared to SCTs and MCTs—of the MNTs make for large, heavy telescopes. The presence of the corrector means the MNT will always be heavier than a comparable Newtonian, and harder to mount adequately. These things are likely the reason for the MNT’s lessened popularity in recent years, though it is still prized by some planetary observers. Like other CATs, the MNT can need collimation, which is achieved by adjustment of both the primary and secondary mirrors. Most MNTs, like most MCTs, rarely require attention. There is one other (somewhat) common CAT, the Schmidt Newtonian. What’s that? Take an MNT and replace the deep-dish Maksutov meniscus corrector lens with a Schmidt corrector and you have an SNT. The SNT is much like the MNT: medium - fast focal ratio, reasonably small secondary. But maybe with slightly lessened optical quality due to the harder-to-do-right Schmidt corrector. “Maybe,” because to my knowledge nobody is doing an upscale SNT. The only commercial Schmidt Newtonian I know of is the Meade LXD-75, which is a bargain instrument, and probably does not demonstrate everything the design is capable of. In collimation, an SNT—as built by Meade—is, like the MNT, a combo of an SCT and a Newt, with both secondary and primary requiring adjustment. Doable, certainly, but a little more difficult than SCT/MCT collimation. So there you have it, all the readily available commercial telescope designs. Well, all those likely to be of interest to beginners focused mostly on visual observing. Which should you choose? Only you can decide, and a bigger help than reading the cotton picking Internet and looking at magazine advertisements is getting out and trying a few. At your club’s observing field. Pick the brains of your fellow astronomy club members, too. What have they favored most over their years of observing? You ain’t a member of your local club? Fix that. I insist. You still want to know which one I think you should pick? OK. But don’t complain if you don’t like my answers. If you intend to start out and maybe stay a purely visual observer, and especially if you don’t want to spend a whole lot of money at first, get yourself a Dob-Newtonian. Maybe one of Orion’s scopes. How big? All things being equal, more aperture is always better—“aperture always wins,” some of us like to say. But all things are not always equal. Don’t convince yourself to get a scope that’s so large you will be reluctant to take it out for a weeknight 30-minute look at the Moon. That said, also do your best not to go below 8-inches. You think you might want to do more than just look at the Moon? Maybe take pictures of it or even the neighborhood galaxies some day? Or do other interesting things like put a deep sky video camera on the scope? Think “SCT.” The advantages of the SCT are its portability and versatility. It may not be the best at any one thing, but it is very, very good at many, many things. Next Time: I have received a set of the Sky and Telescope DVDs. What, you’ve been living under a rock and don’t know what the hell Unk is a-talking about? Sky and ‘Scope has put nearly seven decades of their wonderful magazine on disk. And you can dang well be sure I am excited about it and am gonna tell y’all all about it next Sunday. “He” being Atlas, the Titan who, in Greek mythology, was condemned to hold the sky up. But how does the modern Atlas hold up to the sky? And what in tarnation is Unk going on about now? If you ain’t guessed, I am talking about that most ubiquitous of German equatorial mounts in the first decade of the 21st century, the Orion Atlas, a.k.a. the Synta EQ-6. The Atlas has been around for quite some time now, beginning life as a non-computerized German equatorial about a decade ago. Frankly, it was the first Chinese-made mount to impress western amateurs. It wasn’t perfect, suffering from less than good gears, but it was big and it was cheap and it was clear Synta intended to keep improving it, just as they had their smaller EQ-4/CG5 mounts. In a remarkably short time, the Atlas was given a complete makeover, which included go-to via a new motor control board and a “SynScan” computer hand controller. Many of its former faux pas were corrected, too. The gears on the go-to version were much higher in quality than the old ones, and the weasel fat-based glue-grease slathered on ‘em had been replaced by a decent lubricant. We amateurs noticed what Synta was doing with this mount, and before you could say “Jack Horkheimer” err… “Robinson,” the EQ-6 had become the choice for budget-conscious astrophotographers the world over. The EQ-6/Atlas developed a reputation for being one of the most trouble-free go-to GEMs available at any price for use in any amateur application. That’s what everybody said, anyhow. What did I think about the Atlas? I didn’t think anything about it. I was perfectly happy with the Celestron CG5 I’d bought to replace the fork mount of my beloved 1995 Ultima C8 SCT, Celeste. That decision is a story in itself, but, to summarize, I was tired of not having go-to for my C8, I was tired of wrestling with an equatorial wedge for visual observing, and I was tired of contorting my middle-aged bod to find objects and view them with the wedge-mounted Celestron. The CG5 worked out splendidly. I was gobsmacked at how good its pointing accuracy was, almost as good as that of my NexStar 11. No, it wasn’t in the Astro-Physics or even Losmandy league, but it was able to bring back some long-exposure deep sky images that made me happy. Why would I need another mount? That became clear one windy early spring night at the Chiefland Astronomy Village. My usual astro-camera is not a long exposure CCD rig, but a deep sky videocam, my Stellacam II. It lets the C8 go insanely deep, and is pretty forgiving when it comes to tracking errors. I’ve been using the CG5 with the C8/Stellacam ever since I got the mount, and it’s proven to be quite adequate for that combo of scope and camera. “Adequate”? It’s usually fantastic. Not on the run in question, though. What started as a mild breeze wound itself up into genuine gusts of wind, and afore long my images were dancing all over the monitor. Removing the dew shield, which was acting like a sail, helped some, but not enough. Worse, even with the dew heater cranked up to ten, I had to shut down due to a soggy corrector long before I was ready. Also, while I generally do my imaging with video, there are times I want to use a DSLR or my SBIG CCD, and three years ago was one of those times. I was finishing up a book, Choosing and Using a New CAT, and I needed pictures. Not just pictures, either, but my pictures. I’d sworn every astrophoto in the new book would be a genuine SCT shot, preferably done by me. While I’d got some OK images with the CG5 and my still CCD cameras, I decided a new GEM mount was in order in the interest of More Better Gooder. Which German mount? Tightwad that I am, I not only ruled out Bisque and Astro-Phyiscs, I also crossed the Losmandy G11 and Celestron CGE off my list. These are the usual “step up” GEMs, but 3K seemed like a hell of a lot to pay given my lack of astrophotography talent and the lack of nights down here good enough to practice that difficult art. Which left what? The EQ6/Atlas. 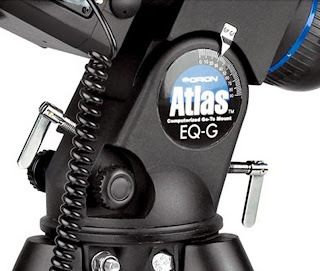 I’d heard a lot of good things about the Atlas, which is what Orion Telescope and Binocular Center has always called the Synta EQ-6es they sell. How good did I think it really could be, though? Its maker, Synta, also made the Celestron CG5, which I adored. Surely the Atlas would be a little better, a little steadier at least. I was ready to pull the trigger on the big Synta just before Christmas 2007. There was one other decision to make, though: go-to or no go-to? Y’all know me. I love computerized scopes. Why would I consider popping for a non-go-to GEM? I wouldn’t. If I got the non-go-to Atlas, it would only be with the idea of turning it into a go-to. How the hail would I do that? Save for the SynScan hand control, the (no longer sold) non-go-to version of the Atlas was the same as the go-to. Same internal electronics, just a different, “manual” HC. I could save myself a couple of hundred by opting for the no-go version and making it a go-to with EQMOD, a freeware program that, like Celestron’s NexRemote, takes the place of the hand controller. In the end, I opted for go-to; I figgered having the SynScan HC would be handy for those times when I didn’t want to lug a computer out—public outreach nights, for example. Before we talk about the “what” of the Atlas, we maybe should talk about the “why,” as in “Why should you buy an Atlas/EQ6 instead of the more recent and snazzier Celestron CGEM?” That is a question I hear a lot of late. Many of you, it seems, are agonizing over the choice between these similar—yet different—GEMs. What do I say? I say you’re lucky to have a choice, I didn’t. I was sitting fat, dumb, and happy with my new Atlas. I was impressed with it, and especially by its bulk. I remember the mount’s first real night under the stars down at Chiefland in January of ought-eight. I was done with set-up and was strolling the field waiting for dark. My orbit eventually took me past one of the mounts I’d briefly considered in my GEM quest, the Celestron CGE. It was a sweet-looking thing, but I was flat-out amazed at how small its EQ head looked compared to the Atlas. Certainly size is not (always) everything, but the Atlas proved himself that night, taking guided astrophotos that delivered round stars for as long as I wanted to go. Which don’t mean the Atlas is perfect. It is a 1500 dollar-class-mount. Unlike the twice as expensive CGE, it is not a good choice for a C14 (neither is the CGE or its inspiration, the G11, really), but with a payload capacity of 40 pounds, it is well suited to a tricked-out C11 and many other sizeable tubes. If there’s anything that drags it down, it’s the too-light tripod and Vixen style OTA mounting saddle. Those aren't huge impediments, however. There are enough Atlases out there now to support a third party industry selling add-ons for it, and creative owners have come up with improvements that have moved the mount at least half a step up the ladder. Atlas users not satisfied with the stock tubular-steel tripod have adapted G11 and CGE tripods to the mount, and several vendors are selling Losmandy "D" compatible saddles to replace the Vixen dovetail bracket. Course, switching from the NexStar way of doing things to the SynScan way wasn’t all gravy. A lot of the features in the NexStar I’d come to take for granted are lacking in the SynScan. The Celestron HC, for example, includes an effective polar alignment routine. With the Atlas, you use the mount’s built-in polar alignment scope, just like the bad old days. Oh, well. I’d get used to it, I reckoned. The reduced feature set as compared to my CG5’s computer seemed worthwhile for such a solid mount. So I was happy. Till I heard about the CGEM. It seemed Synta was putting together a new “EQ-6” for its Celestron brand. Not only was the EQ-6’s old Takahashi-EM-200-clone external appearance radically updated, the mount’s innards were changed, too. Synta swapped the EQ-6 stepper motors for servo motors, which allowed the SynScan hand control to be replaced by the fancier NexStar HC. Dadgummit. If only I’d waited a few more months I coulda had what I really wanted: a bigger mount and the Celestron computer. I was in a snit for a while, but the mount blues began to lift shortly. My Atlas did everything I wanted and needed it to. Taking the images I required for the book was as painless as astrophotography ever gets. I was even able to bring back some recognizable images of M42 the first night I ever tried a DSLR with a telescope. The EQMOD program was fantastic, fully the equal of the much-loved NexRemote. 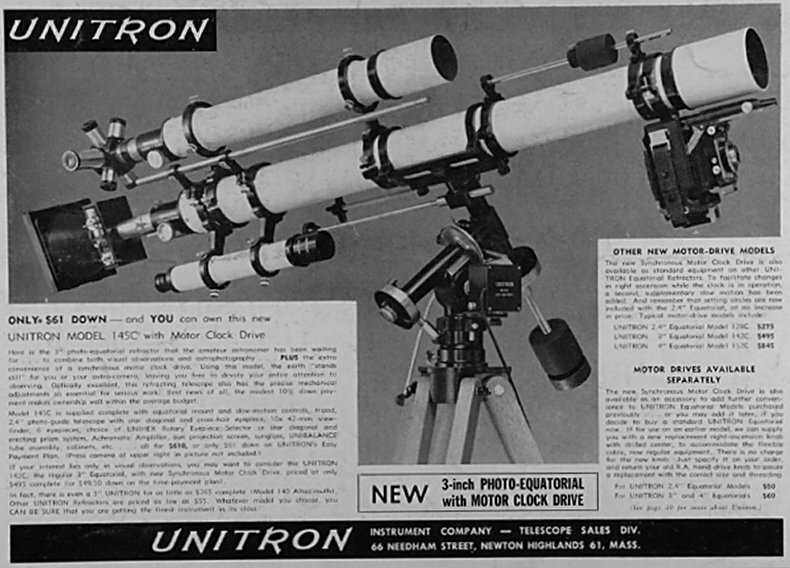 More importantly (or worriedly), it seemed the CGEM was not to be one of Celestron’s more trouble-free product introductions. It’s hard to tell what the real story is with a piece of gear—at first, anyhow. Whether you talk to owners in person or over the fracking Internet, you get a biased view, with people who have issues tending to speak up more loudly and often than those who don’t. Nevertheless, the number of serious problems I was hearing about told me all was not rosy in CGEM land. Most of the difficulties seemed traceable to the NexStar hand controller. Some weren’t quite right. Some acted slap crazy. Some were dead out of the box. There sure seemed to be a lot of bad ones, too. One evening when I was having supper with one of my mentors in this business, Doc Clay Sherrod, I mentioned the CGEM debacle. Doc confirmed what I’d suspected: Celestron had got a bad batch of HCs. Which didn’t sound that bad; if that were the only problem, Celestron ought to be able to get things back on the track without much trouble. Alas, CGEM problems continued even after the HC situation began to improve. Distressingly, mechanical issues began to be reported: locks that wouldn’t lock down the right ascension and declination axes firmly. Backlash. Mechanical binding that would crop up after months of use. I noted some outfits were beginning to sell replacement lock levers and other “fix” items for the CGEM. Which left me a little dubious. When I see vendors offering accessories designed to make a mount work right rather than just better, I get nervous. Does this sound like sour grapes? It really ain’t. I want Celestron to succeed with the CGEM. When the bugs are out, it will probably take over from the Atlas as “best value in a medium duty mount.” With the strength of Atlas and the smarts of NexStar, it will be hard to beat. But it ain’t there yet. I’ve heard less about problems of late, but I still hear about them. Me? For a while I was considering selling the Atlas for a CGEM. Not now, and not just because of the CGEM’s growing pains. I’ve become reacquainted with my Atlas, and have been impressed all over again. REacquainted? I hadn’t used the Atlas much since I put Choosing and Using a New CAT to bed. Why not? The CG5. It’s gone through numerous software revisions in the five years I’ve had it, and Celestron has turned it into one of the best working mounts it’s ever been my pleasure to use. Yes, I knew it could be a mite shaky under the wrong conditions, but it was so nice and light and easy to load and unload that that didn’t seem a bad trade-off for the longest time. Then came a blustery eve on the PSAS (Possum Swamp Astronomical Society, natch) observing field, windy enough that I had to forget about imaging with the Stellacam and go visual, which was annoying. I got to thinking, “Maybe it’s time to give the Atlas another shot. Shame not to use the bigun. Sure woulda come in handy on a night like this.” I resolved the CG5 would stay home in favor of the Atlas for the next dark-site run. When that night came, just a couple of weeks back, conditions were not encouraging. It was clear it was gonna be a sucker-hole-ridden hazy one at best. I decided to forget the Stellacam. It would have been tempting just to lug Charity Hope Valentine, my ETX125, out to the club site, but I’d resolved to get the Atlas going again, and that I would do. But not with a computer and EQMOD. I’d keep it simple. I wanted to try out the SynScan HC, anyway. I’d never used it under a decent sky, and despite updating its firmware as new releases had come out, I’d used it exactly twice in the near three years I’d had the mount. I always hope to be pleasantly surprised on these iffy evenings: “Hell, all of a sudden, the clouds blew off and the Milky Way started burning.” Sometimes that actually happens. Not on this night. It started out cloudy, hazy, and humid and stayed that way. Until it got worse. At sundown it did look good enough to get the Atlas and C8 aligned, so I proceeded to do so. 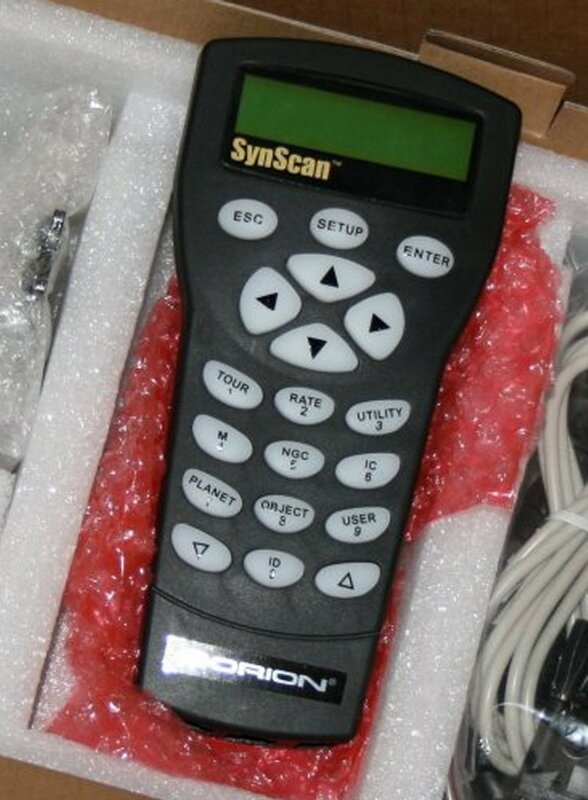 Yes, the SynScan looks a lot like the NexStar remote, but it is a horse of a different color (the one you’ve heard tell about). The keys are different, the feature set is different, and the alignment procedure is different. One difference I approve of is that the SynScan plugs into the mount head via a nice DB9 connector instead of the puny RJ telephone style plug Celestron uses. And this HC beeps at you with a teeny-weeny speaker, unlike the mute NexStar. With dark coming and the sky looking at least passable, I fired Atlas up. Not that I was ready to start the go-to alignment yet. I’d have to polar align the thing first. Turning on the Atlas illuminates the polar scope crosshairs and (after some data entry) displays the current Polaris Hour Angle on the SynScan. The wha? Unlike the NexStar, there’s no polar alignment routine in software to help get the GEM’s right ascension axis pointed at the North Celestial Pole. So, you’ll use the mount’s polar alignment borescope. There are a couple of ways to do that. Easiest, though least accurate, is to just move the mount in R.A. till the pictures of the Big Dipper/Plough and Cassiopeia on the polar scope reticle match the approximate positions of the constellations in the sky. 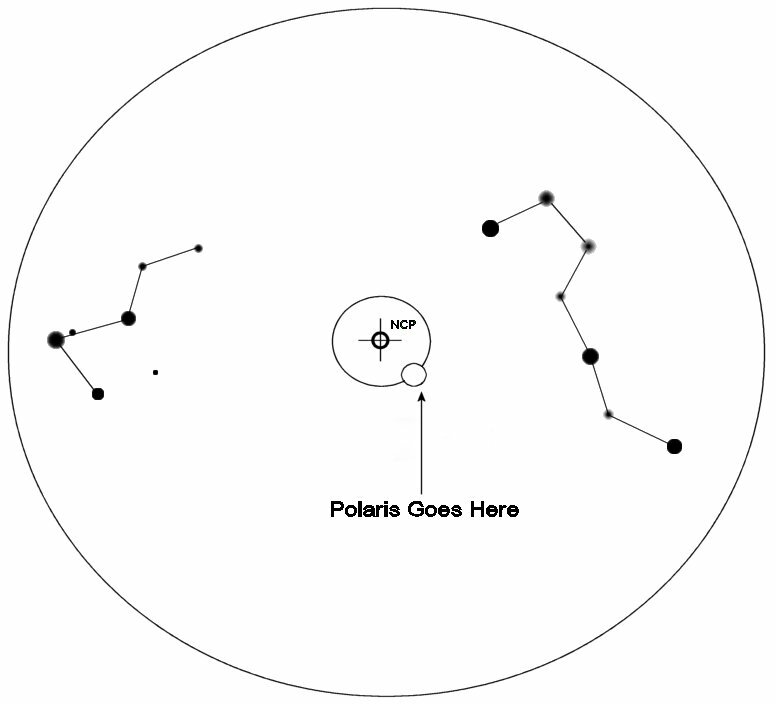 After that, you move the mount in altitude and azimuth to put Polaris in a little circle on the reticle and you are polar aligned. Sort of, anyhow. Almost as easy, and considerably more accurate is using Polaris’ Hour Angle. That sounds scary, but is easy. Once you’ve got the mount set up, you rotate in R.A. until the circle on the reticle where Polaris goes is on the bottom, as close to straight down as you can get it. Loosen the set screws (two of them) that hold the analog R.A. setting circle motionless, and turn the circle until 0 (hours) is under the pointer. You don’t move the mount in R.A., just the circle. When it reads 0, tighten the setscrews down. Setting circle set, light-off the mount and enter the vitals: time, date, etc. The SynScan will come back with the current Polaris H.A., which will be in the form of a “time,” 13:30, for example. Unlock the mount’s right ascension lock and rotate in R.A. until that time (on the circle's inner scale) is under the pointer. The rest is easy. 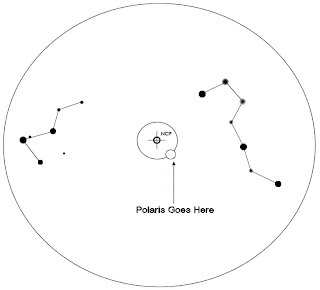 Look through the polar scope and adjust the Atlas in altitude and azimuth (not R.A. and declination) using the bolts and knobs on the mount head until Polaris is centered in its circle. Voila! You are decently polar aligned. Not as easy, maybe, as the computerized Nexstar procedure, but not bad, and good enough for me. Possible complications? If you use a long-tube scope, you may want to remove it during the polar alignment procedure, as positioning the reticle properly may put the tube in positions where it will bump into a tripod leg (you must keep the tube perpendicular to the polar axis, at declination 90, to use the polar borescope). Also, some folks worry about the altitude and azimuth adjusters, as they seem awfully hard and sticky on some mounts. I definitely had that problem with azimuth. Moving the mount right or left with the (too small) knobs practically tore the skin off my fingers one night. Solution? Some people place a thin Teflon disk between mount head and tripod. That works well, but seemed like a lot of trouble to me. My cheap, lazy solution? A thin coating of bicycle chain grease on the two surfaces ensured I had no further problems. Leaving the threaded bolt/rod that fastens mount head to tripod a little loose until alignment is done also helps. Then there is altitude, which, as is the case with most GEMs, is adjusted by alternately tightening and loosening forward and aft “latitude” bolts on the mount head. The secret to moving the mount in altitude without busting a gut? Loosen the forward bolt and adjust only with the aft bolt. If the mount doesn’t want to go down when you need to go down, just a little downward pressure on the counterweight bar will ease things along. Apply firm, even pressure when raising the scope in altitude and don’t use a cotton pickin’ pair of vice grips. Too much force and you can bend the bolt. It’s not needed anyway. If “up” seems too hard, remove scope and counterweights (in that order) during polar alignment and you will be in like Flynn. So you are polar aligned with the polar scope. Do you need to drift align? Probably not. Not unless you are a much more serious astrophotographer than I am. An alignment with the Atlas’ polar scope allows me to do 3-minute integrations with my CCD camera and my C8 at f/6.3, and that is all I need. If you are just observing visually, don’t even worry about adjusting the polar scope’s reticle and figuring out hour angles. Just center Polaris in the borescope. Admittedly, the closer you are to the pole, the closer the mount will come to the first go-to alignment star, but that’s all. Oh, if you insist on doing a one or two star go-to alignment instead of a three-star, a close polar alignment will help with pointing accuracy. How about go-to alignments? In this area, the Atlas is, again, a little more primitive than the NexStar, but is completely adequate. These days, you align a Celestron GEM on as many as six stars, which ensures excellent accuracy all across the sky. SynScan? It is where the NexStar was several years ago. Unless you have a dead-nuts-on polar alignment, you do a three star go-to alignment, which consists of two stars on one side of the Local Meridian and one on the other. This third star is the “cone alignment” star. Centering it up allows the computer to take any mechanical misalignments present into account. One thing I’d been told and had found out for myself in my two outings with the SynScan HC was that, unlike with the NexStar, you are wise not to blindly accept the first alignment stars the HC comes up with. Instead, use the SynScan’s up and down keys to select the best candidates. The first two stars should be fairly far apart in azimuth, up to 60-degrees apart, and not too close to the horizon. Certainly no closer than 15 degrees or so. MOST importantly, star 1 and star 2 should be separated by several hours of right ascension. That appears to be critical for go-to accuracy. Star 3 should be between either declination +30 and +70 or between declination -30 and -70--in other words, not too close to the poles or the celestial equator. Like stars 1 and 2, it should not be close to the horizon, either. The Atlas manual does a good job of explaining the requirements for alignment stars, so read it. A couple of times. My problem on this poor night in Tanner – Williams, Alabama was finding three stars in the clear that fit these requirements. The number of possible alignment stars the SynScan allows you is fairly limited, too. I just did the best I could. Star one was about a degree out when the slew stopped; stars two and three were right on the edge of the center ring of Celeste’s Telrad, which I habitually use for alignment instead of her 50mm finder. “Alignment Success” Atlas said. We’d see about that. M13, which was close to culmination, almost straight overhead, would be a good test, as many go-to systems tend to have trouble with stuff up in Dobson’s hole. I punched in “M13” (at least SynScan doesn’t demand you enter “M 013” like the NexStar). In due time, the HC beeped and I stuck a 20mm Expanse eyepiece in the diagonal—yeah, I was really going minimalist on this evening. There was M13, on the edge of the field at f/6.3, but in the field nevertheless. I then essayed a walkabout of the midsummer sky, visiting everything from Lyra in the east to Virgo in the west. Anything I requested was somewhere in the field of the 20mm, and often in the field of a 9mm Expanse. I had a lovely time for an hour or so, checking in on all the summertime gang. Those sitting in sucker holes, anyhow: M57, M56, M27, M71, M80, M4, M13, M92, M22, M8. Then to the other side of the sky, to the rapidly descending spring bunch: M3, M53, and every Virgo Messier that was even minimally clear of the clouds. One especially pleasant thing? How quiet the Atlas is compared to the CG5, which is near the Meade decibel level. Atlas is so quiet that it’s a good thing its HC beeps when it’s reached a target; standing a couple of meters away, you’d never know otherwise. Just as I was contemplating having a look at Ursa Major’s Messiers, the sky began to close down. It was pretty clear it was time to start thinking about packing up, even though it wasn’t quite 11pm. The sky wasn’t going to get any better any time soon, and had the look of incipient “much worse.” An old Moon would be on the rise before long, anyhow. Alrighty, then. 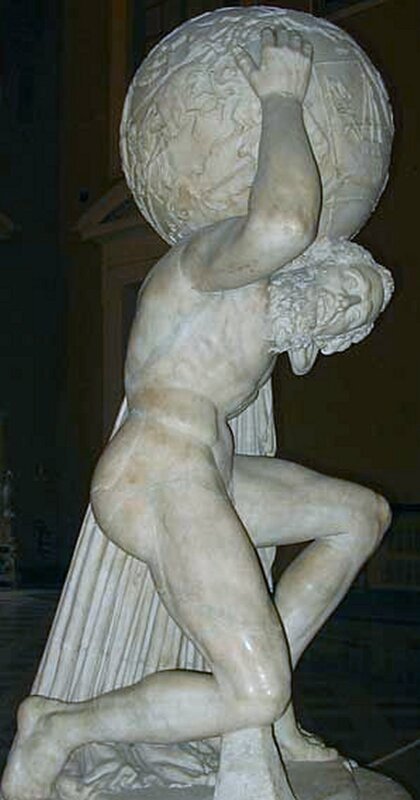 I lugged Atlas’ head back to the Toyota. It is, at close to 40-pounds, considerably heavier than the CG5. It didn’t feel that way, though, and packing up for the drive home was a breeze. Maybe because the Atlas is less awkward than the CG5. You can retract the counterweight shaft into the body of the mount, and there’s no external declination cable to snag on anything or cheesy plastic motor covers to worry about. For good or ill, the tripod is almost identical to the one shipped with the CG5, so that is not a factor. Verdict on the mount’s go-to capability with the hand control? If you choose alignment stars carefully, the SynScan’s accuracy is on a par with that of the NexStar HC, despite the fact that it is limited to a three-star alignment. While the extra cone stars the NexStar HC allows you to use supposedly improve pointing accuracy, the SynScan seems just as good at object finding. Need more better gooder? Use the EQMOD program instead of the SynScan controller, and you can center on as many alignment stars as you need, which can, potentially at least, deliver arc second level pointing accuracy. OK, then. It sounds like the SynScan is good but EQMOD is better. How does EQMOD fit into the Atlas story? I’d intended to tell y’all, but we are utterly out of space for this morning, and that will have to be a story for another Sunday. Cain’t wait? I did a pretty complete review of EQMOD in the December 2008 issue of Astronomy Technology Today magazine. Don't have that one? Individual back issues are not available at this time, but a mere 30 bucks will get you ALL the back numbers, which I call a b-a-r-g-a-i-n.
Anyhoo, where things stand with the Atlas now is that I have at least provisionally demoted my CG5 to “backup GEM” status. We will see how the Atlas/EQMOD does with the Stellacam II and the Herschel Project when I finally get some clear and dark skies, but I think I am gonna be one happy camper with the combination. You’ll know how that went soon after I do, muchachos. Coming Soon: The good folks at Hotech are lending your ol’ Uncle one of their new fangled Advanced CT Laser Collimators for an eval, and, as you might expect, that will be the subject of a blog as soon as the gadget’s in my hands and as soon as dumb li’l ol’ me figures out how to use it. Given the excellent documentation, which I’ve already looked at, I speck that won’t be too long. Book Heads Up: This is not a review, not yet, since I haven’t had time to even start the book in question, but I just received an advance copy of what looks to be a fantastic novel, Michael Byers' Percival’s Planet. While this is a partial fictionalization of Clyde Tombaugh’s story, my brief browsing shows it is pretty true to that story, nevertheless, and that Mr. Byers has not spared the technical detail and background you and I crave. It was Stephanie’s telescope that did it, muchachos. That’s what set me on the road to amateur astronomy. Or, maybe, that was just the final spark that lit my fire. As I told y’all a while back, I’d been observing the sky with my eyes and with toy binoculars for quite a spell before Miss Stephanie brought her wonderful Christmas telescope to school for Show and Tell. I’d been looking at the sky, yeah, but beyond the few stars and constellation patterns I’d learned, I didn’t know much about it. Stars rectified that the Christmas after Stephanie’s telescope. As you may have deduced if you’re a regular reader of the Little Old Blog from Chaos Manor South, I am not the church-going type. I admire people with strong faith, but I’ve never had it. Even as a little bitty kid who was dragged to Sunday school by his Mama. The picture books in the classroom at the Dauphin Island Parkway Methodist Church (which Mama favored; the friction on this subject between her and my Catholic OM was probably one of the things that turned me off to the whole business) were strange and scary to my eyes. That doesn’t mean I think religion is bad or at least always bad, just that I’ve never had a feel for it. Even into early adolescence, though, I wanted to believe, maybe so I could Be Like Everybody Else, which was why I grudgingly and at Mama's behest kept going to Sunday School. It turned out that not only did Mama expect me to attend Sunday School, she absolutely insisted I go to occasional extracurricular activities as well, like the class Christmas party our Sunday school teacher had planned. I wasn’t overly enthusiastic about that, but the holiday season usually stimulated what little religious feeling I’d been able to dredge up. And I could be bribed. One afternoon, Mama sent me to her and the OM’s bedroom to fetch her sewing basket off the shelf of their closet. When I pulled it down, what should I spy lurking in the back corner but an AMT model car kit. A fancy one. I was never a huge fan of plastic model cars. I tended to favor airplanes, Aurora’s Universal Monster Models, and, especially, spaceships. 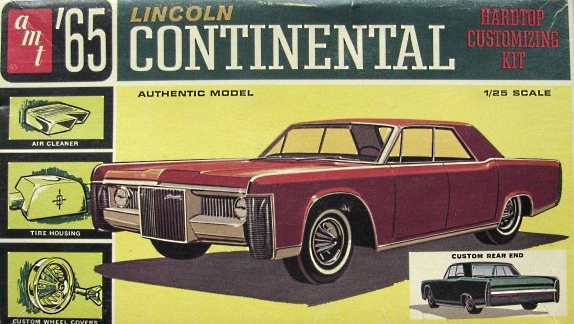 But I liked glue-em-together kits of any kind, and it was apparent this was a cool one, a 1965 Lincoln Continental that included customizing options—which meant you got some extra plastic pieces and a tube of body filler putty. I put two and two together: Sunday School Christmas party + lone gift (there was no sign of SANTA STUFF) = score if I went to the dadgum party. Well, in return for an evening or two’s model-building enjoyment, I guessed I could put up with an hour or so of punch, cookies, and praying. Also, I was pretty sure Miss Jitter Jones, one of my fellow 6th grade classmates who I suddenly and strangely found I wanted to spend much time with, would be there, too. The party actually wasn’t so bad. Above and beyond the prospect of a free model kit and the presence of the fascinating Jitter, I was in the holiday mood—maybe the 1964 Perry Como Christmas Special had helped—and was able to endure a half hour discussion of The Christmas Miracle with good grace. After the inevitable punch and cookies and considerable time spent in soulful conversation with Miss Jones, it was time to open the presents. Our not at all youthful Youth Leader, Miss Emily Baldwin, played Santa, handing out the gifts with what for her was wild abandon and unaccustomed good cheer. I couldn’t help wondering if the normally spinsterish and reserved and sometimes dour Mizz Baldwin had got hold of some high octane eggnog someplace. I could have used some myself when the substantial box that contained the AMT model, and which I’d had an eye on all evening, and which I assumed had my name on it, didn’t wind up in my hands but in the eager ones of my buddy, Wayne Lee. I got a smallish package, maybe the size of a paperback book. What the hey? Ignoring Wayne Lee, who had ripped the paper off and was chirping with the unbounded enthusiasm for which he was known, “OH BOY, AN AMT!” I removed the wrapping of my gift without much hope, to expose the little book pictured below. Naturally, with Miss Jones in attendance, I did not want to whine about my inexplicable bad fortune. And a book was more adult than a crummy model car, right? When the festivities were over and Jitter and I had said our long goodbyes—her parents were spiriting her off to Andalusia to spend Christmas with grandma—I phoned Mama to pick me up. I normally rode my bike up to youth functions like the MYF ("Methodist Young Folks" we thought that was), but Mama was sure I’d find a way to mess up my good clothes if I did so on this evening, and she was probably right. Wayne Lee had hurried off home—to assemble that dang model car, I figured—so I loitered around outside the Sunday school building, watching for Mama. Not that you could miss her in her beloved shocking-pink 1957 Oldsmobile Rocket 88, which roared in for its touchdown in due course. I am to this day still not sure how I wound up with Stars. It’s possible Mama, generous soul that she was, had furnished both my and Wayne Lee’s gifts, since I think his folks were experiencing economic hard times, something all of us on the lower end of the middle class were acquainted with back then. Or maybe she’d just volunteered to pick up Wayne Lee’s AMT kit for his mama, who worked evenings at the Kwik Chek grocery. What I suspect today is that the caper has “Emily Baldwin” written all over it. She made no secret it was her mission in life to get me Interested in Science, and she’d been wearing her patented cat-who-ate-the-canary look when she handed me my Christmas present. Whatever the reason, I sure was lucky Wayne Lee got the Lincoln Continental. Back home in my room, I deigned to actually pick up Stars and have a look. I was immediately struck by the glossy cover, which featured pictures of wildly colored planets, Moons, stars, and nebulae with my fave planet, Saturn, dead center. I was intrigued by distant Uranus, which was so fascinating in Journey to the Seventh Planet, but it was Saturn and his rings I really wanted to see. I was badly disappointed my Cub Scout Den hadn’t got to see the ringed wonder the night we visited Springhill College’s observatory. When Miss Baldwin, who was also our Den Mother, naturally, inquired about Saturn to the physics student running the 12-inch Cave behemoth, he replied that we wouldn’t get to see Saturn because it wasn’t in the sky that night. Which puzzled me. Wasn't in the sky? Wasn’t Saturn always in the sky? Where else would it be? Maybe Stars would explain that. It did. And how. The author, Herbert Zim, wasn’t an astronomer, but he was a prolific science writer and was the Editor of Western Publishing’s Little Golden Nature Guides series. Not only did Zim oversee the imprint, he authored many of the titles, everything from Fishes to Wildflowers. 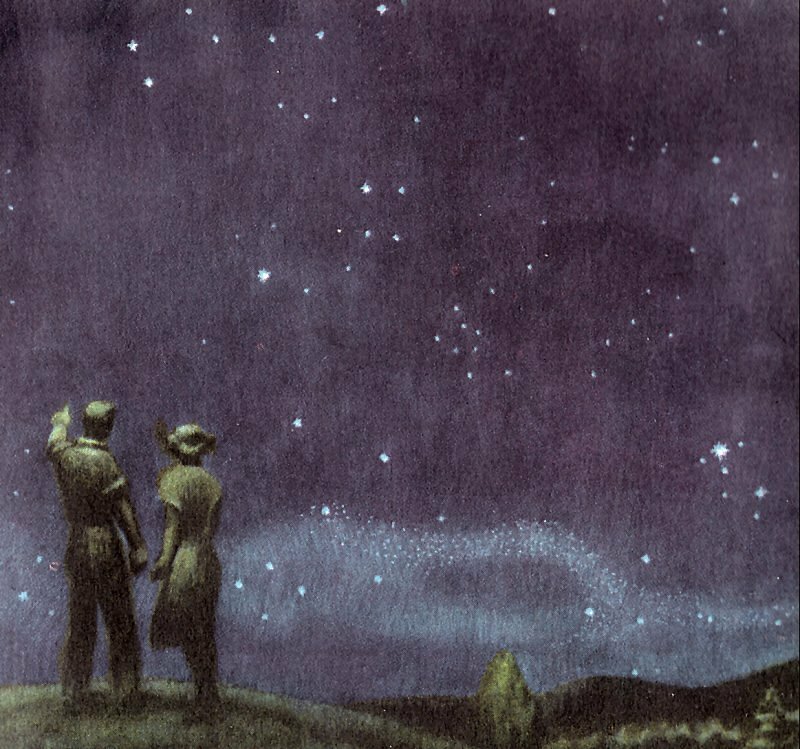 I don’t know if Zim had a special interest in the night sky or not, but he sure knew how to put together a book on the subject. His prose is strikingly clear, and the man had that gift common to all great authors of children’s’ books: he didn’t talk down to his audience. He merely explained the facts of the Solar System and the larger Universe as they were understood at the dawn of the Space Age. It’s not an exaggeration to say that when I finished reading Stars, just an evening or two after I received it, my knowledge of The Great Out There had increased ten-fold. And it was fun learning. Not just due to Zim’s clear telling, but because of the charming and informative illustrations, tables, and diagrams by Stars’ illustrator, James Gordon Irving. 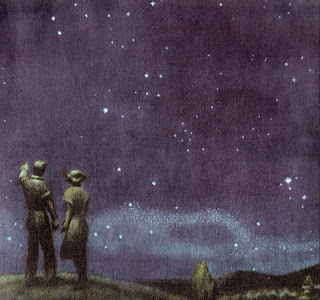 Yes, Herb Zim’s text helped me understand the simple concepts I’d been ignorant of, including the fact that the planets move against the background stars, but what I remember most fondly is Irving’s delicious paintings and pastel drawings. His depictions of the planets are, in fact, still the way I see them in my mind’s eye. The little volume just had in incredible effect on me. I read it and I reread it. I even took it to school when my sixth grade teacher, strict but pretty Miss Stinson (I thought she was the prettiest teacher in the whole school), announced she’d decided to cut back on THE NEW MATH—which was her passion—for a couple of weeks and (YES!) do a space-science unit with us right after Christmas. One day, Miss S. strolled into the classroom bearing a dozen big sheets of butcher paper. She told us she wanted us to break into groups and make posters of the Solar System. Naturally, my group was composed of me, Wayne Lee, and Jitter. I was enthusiastic enough about the project to bring Stars in to serve as our reference, and soon we not only had the Sun and planets sketched out, we were making little annotations on our poster about meteor showers, and had added a few asteroids to the gap between Mars and Jupiter thanks to Dr. Zim. Heck, to my surprise, silly old Wayne Lee really got into it. The ever-attractive Miss Jones? Not so much. She spent most of her time sidling up next to me, wondering if I needed anything, declaring she’d be only too happy to bring me a coke from the machine at recess if Wayne Lee and I wanted to keep working. I have no fonder memories of grade school than the few days I spent working on that poster with Wayne Lee and Jitter. It’s a bittersweet memory, though, since not long after that, the cotton pickin’ pointy-headed Secretary of Defense, Robert McNamara, closed down our city’s big employer, Brookley Air Force Base, and both Jitter and Wayne Lee moved away and out of my life forever. Stars became my bible, both because it was a wonderful little book and because every time I picked it up I was reminded of the long, languid Gulf Coast summer afternoons I spent with Wayne Lee and Jitter. I was hardly the only kid who loved Stars, though. If any proof of that is needed, it’s that it remains in print even to this day, having been continuously revised over the years, keeping on keeping on after both the death of Herbert Zim in 1994 and Western Publishing’s sale of the Golden Guides line to St. Martin’s in 2001. Which was still in the unimaginably distant future that Christmas of 1964. As you can see by the picture at left, I used the hell out of Stars. 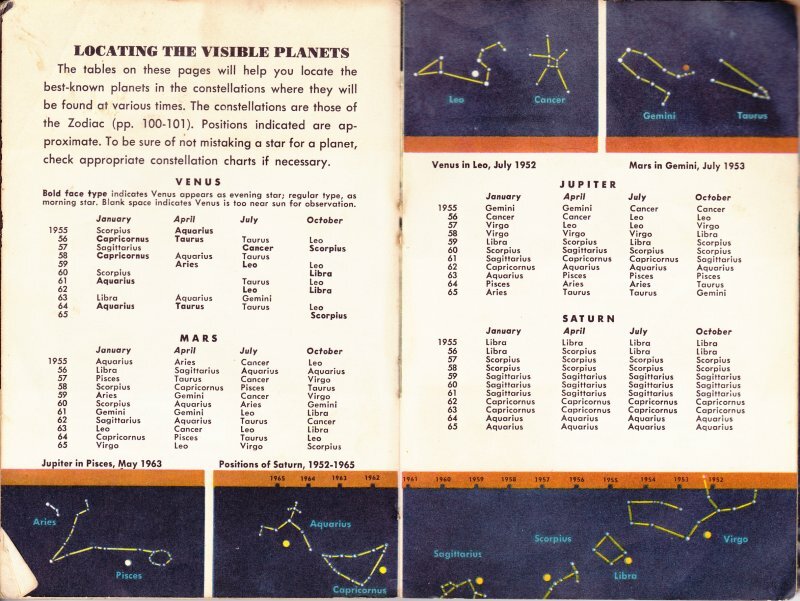 Even after I began to accumulate more “advanced” books like Patrick Moore’s The Amateur Astronomer, I kept on using Stars. It was just so dadgummed convenient. No, its star charts were not overly detailed, but I could stuff the little thing in the back pocket of my jeans, which I couldn’t do with Sir Patrick’s book or an issue of Sky and Telescope. I am proud to say I’ve hung on to my original copy of Stars through the countless moves and two divorces of the intervening four and a half decades. When one of my nieces expressed an interest in astronomy, the first thing I did was go right out and buy her a copy of Stars. 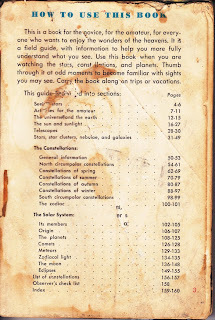 That brings us, finally, to the other subject of this blog, beginner’s astro-books. Even with the Internet and all, there is still a need, a great need, for them. Maybe some of y’all out there in blog-land need one now, not necessarily for yourself, but to recommend to that new person down to the club. Sweet as it is, Stars ain’t the only novice book on astronomy, hardly. And, yeah, it is a kids’ book. One of these Sunday’s I’ll draw up a list of what I think are some other good younguns’ astro-books. This time out, I’d like to recommend books for adult/teenage novices. There is at least some overlap; a book like Stars is more than useable by anybody. But some books are more suited to grown up starry-eyed innocents. Hokay, what say we trot down to the local Barnes and Noble (or Books-a-Million, or Borders, or whatever—if you are not lucky enough to have an independent book seller in town). What we want is the science book section. The Possum Swamp B&N, which recently closed its doors in the company’s pathetic retrenching, in typical corporate fashion tried to give its customers what it thought we wanted. In our case, that was what they thought a bunch of hayseeds would want, I reckon. After they’d been open for a year or two, not only did they dramatically reduce their initially good inventory of science and math books, they hid ‘em away in a corner near the bathrooms. Guess they didn’t want them bad ol’ science and math tomes anywhere where they might harm innocent teenagers. Yes, I am recommending another Little Golden Guide to y’all. Like Stars, it is just as helpful for adults as it is for the kids. 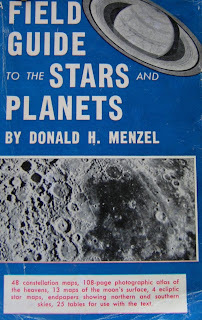 This one, by R. Newton Mayall and Margaret Mayall, may be even better than Stars as a book on amateur astronomy. It’s got a lot more in it about telescopes and practical observing than Stars does, but also includes plenty about how the sky works. Baby Boom generation amateur astronomers tend to be either Stars people or Sky Observer’s Guide people. That may reflect who was initially more interested in the science/theoretical end of astronomy than the practical side and vice versa. Mostly I think it just has to do with which book you ran into first. 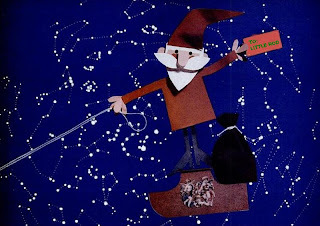 If I’d unwrapped the Mayalls’ little pocket book at that long ago Christmas party, I’m sure I’d be just as fond of it as I am of Stars. 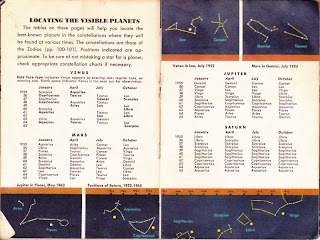 Another sentimental favorite of mine is Dr. Jay Pasachoff’s A Field Guide to the Stars and Planets . What’s its claim to fame? It’s like a big boy’s and girl’s Stars. The same sort of general guide to the night sky, but on a much more detailed level and in a decidedly thicker package—578 pages. Nevertheless, it’s still portable, and even in this computer age, packs an information wallop. Which is what, decades ago, drew me to the original version written by Pasachoff’s mentor, Dr. Donald Menzel, who was, like Jay, a professional astronomer, author, and astronomy popularizer (he was also a UFO debunker of some note, but that’s a story for another day). Even ages ago, this book was filled with maps and tables enough to cover almost any circumstance. I’ve particularly admired the Pasachoff edition(s) for its charts. Within the covers of this paperback you will find a complete star atlas by that dean of celestial cartographers, Wil Tirion. Not only are the charts beautiful, they go down to an amazing magnitude (for a book like this) 7.0. Yeah, they are a little small; I first realized middle-aged farsightedness was coming the night I found I could no longer read the charts under a red light. One other nice thing about Stars and Planets is that Dr. Pasachoff continues to update and improve the book. He is also very responsive to reader requests. Many of his fans are, no doubt, of my generation, and quite a few of us began complaining that the Tirion charts in the book, which were in the white-stars-on-black-sky format, were suddenly and inexplicably hard to read. Jay must have heard and understood, because in the the next edition the atlas charts had been changed to color-stars-on-a-white-sky, and I can decipher the maps with fair ease again—well, with the help of my snickin’-snarfin’ reading glasses, natch. I probably would never have known what a good book Terence Dickinson’s Nightwatch is if my sister-in-law hadn’t been stumped as to what to get me one Christmas nearly 20 years ago. She got me this book, and though I was two and a half decades past “novice,” I loved Nightwatch. Trust me, it’s good, and you want it when you are just getting started. I especially love the book’s big, spiral bound format. It’s convenient to read, and the charts in it open and stay absolutely flat. Yeah, those charts could be a little more detailed, but this is a novice book. The rest of Nightwatch is filled with plenty of good words on getting a scope and looking through it once you’ve got it. What is Terence Dickinson’s other perennially popular book like? The Backyard Astronomer’s Guide (with Alan Dyer) is like a Sky Observer’s Guide for grownups. 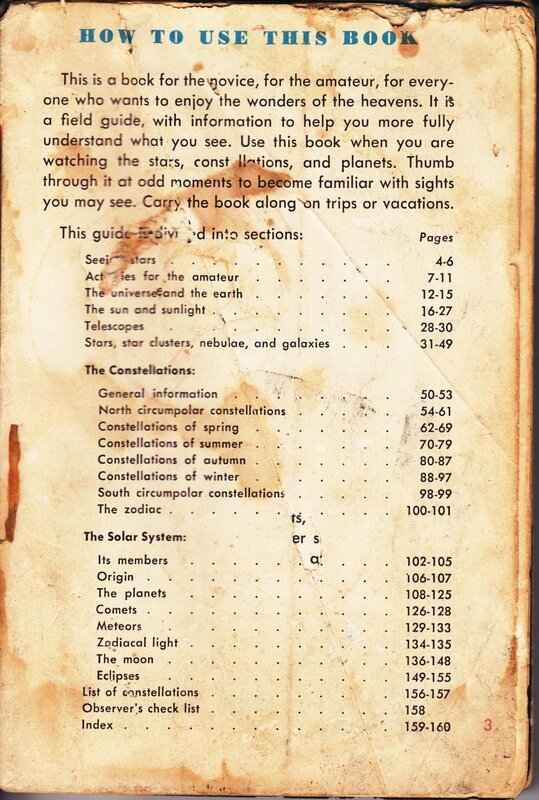 It goes into considerably more detail than that little book or Dickinson’s own Nightwatch, but not so much as to befuddle the average adult novice amateur astronomer. It even goes so far as to get you started in astrophotography. It could stand some updating, though, as the last edition I saw was still stuck in the film imaging age. And if you want specific information about current telescopes, fuhgeddaboutit. You’ll want Phil Harrington’s Star Ware instead. Nevertheless, Backyard is a fine and elegant introduction to the amateur astronomy gestalt and belongs on your shelf. 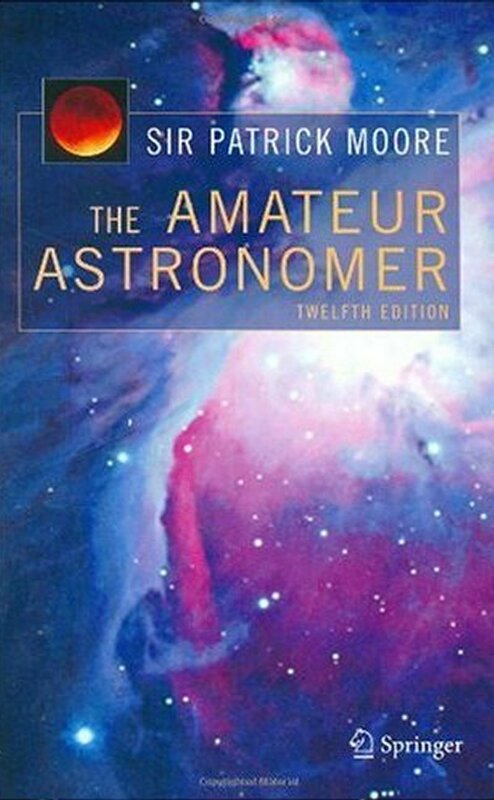 It hasn't been long since I talked about this one, so I’ll just say this was, with Stars, the book that did more to get me going in amateur astronomy than any other. Yes, while it has been updated as the years have rolled on, it’s not exactly on the cutting edge. At least my 11th edition (1990) isn’t. Hell, in the “Telescopes” chapter, Patrick is still warning us away from the pillar and claw telescope mounts that went the way of the dodo half a century ago. Equipment advice isn’t the reason you buy The Amateur Astronomer. You buy it for Patrick’s time-tested wisdom on observing, and especially observing the Solar System. And you buy it for his calm, competent, and friendly words about being an amateur astronomer. I also told you-all about this one not long back. As I said then, it’s kinda like The Amateur Astronomer for a novice who’s more interested in the deep sky than the Solar System. I am not sure it is technically still in print, given the fact that Amazon is selling it at fire sale prices. 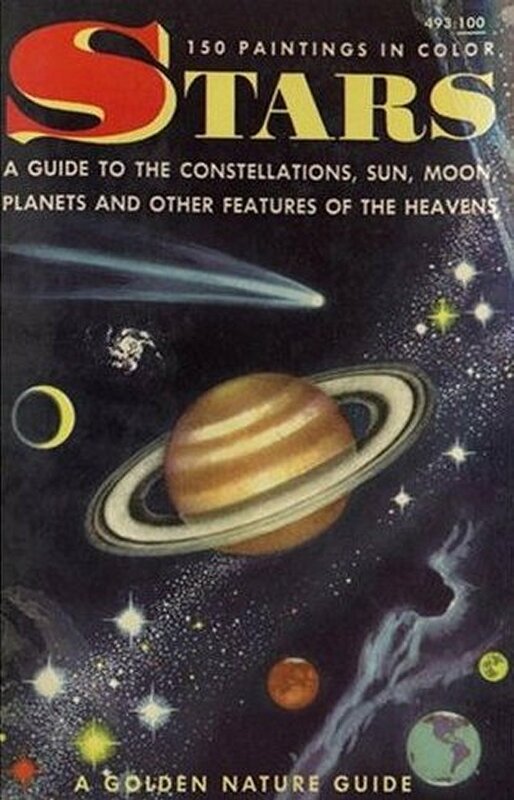 In fact, I think it’s been heavily revised under a new title, David Levy’s Guide to the Night Sky. I don’t care which one you get; you won’t fail to be gobsmacked by David’s lyrical prose and the depth of his knowledge. 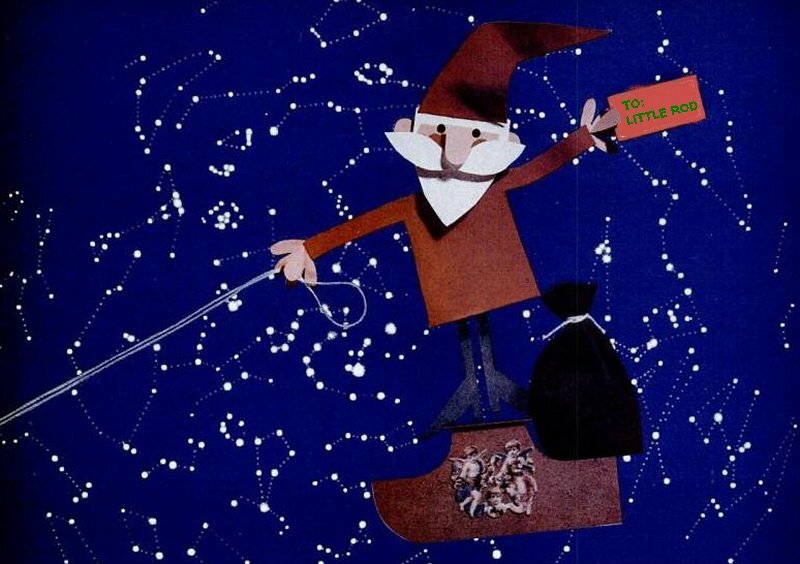 The Rey book has been in print since 1952, and a lot of folks remember it fondly from childhood, but it’s not really good for learning the constellations. The author insists on drawing stick figures in the stars that make the constellations look like their namesakes—Gemini looks like twins, Boötes is a herdsman, etc.—rather than concentrating on star patterns that are easy to find and remember. If I were to do a book on constellations, I’d go in the opposite direction, simplifying even further. My “Cassiopeia” would become “The Golden Arches of Macdonald’s.” Whatev. Rey’s name will live forever as the creator of that Good Little Monkey, Curious George. I’ve never been one to suggest binoculars—just binoculars—to novices. I got started with binoculars, but only because I had to. It took about a year for me to get my hands on a telescope once I decided I wanted to be an amateur. Most novices long for the craters of the Moon and the rings of Saturn more than they do for the wide vistas of binoculars. I do think every novice needs a pair of binoculars, but in addition to a telescope. But...every time I pick up this book, I almost change my mind about that. Phil Harrington’s Touring the Universe through Binoculars is what you should get before buying a pair of binoculars or right after a pair falls into your hands—whether you are a new amateur or not. The book is a big help choosing binoculars, but it’s also a huge help figuring out what the heck you can see with them. It’s not immediately obvious to newbies, but there is an incredible wealth of celestial riches just right for binocs, and your old Uncle Phil tells you all about it rat cheer. If you’re gonna buy one of Phil’s books, you might as well buy two, and I can think of few more appropriate than this one. Obviously a lot of novices agree, since the book is in its 4th edition now, fer Chrissakes. In short, everything you need to know to pick and purchase a scope. Everything. Which is what I did, and which turned out to be a Good Thing. The original was almost completely rewritten, as many mistakes as I could find were eradicated, and I tried not to introduce too many new ones. Obviously the chapters on specific telescopes were completely redone. And only the stuff I thought was really good in the first book (which means “not much”) stayed on in the second one. Who’s it for? If you don’t at least have an inkling a Schmidt Cassegrain telescope, a Maksutov Cassegrain telescope, or one of their catadioptric (lens-mirror) relatives is for you, you’re probably better off with Star Ware. 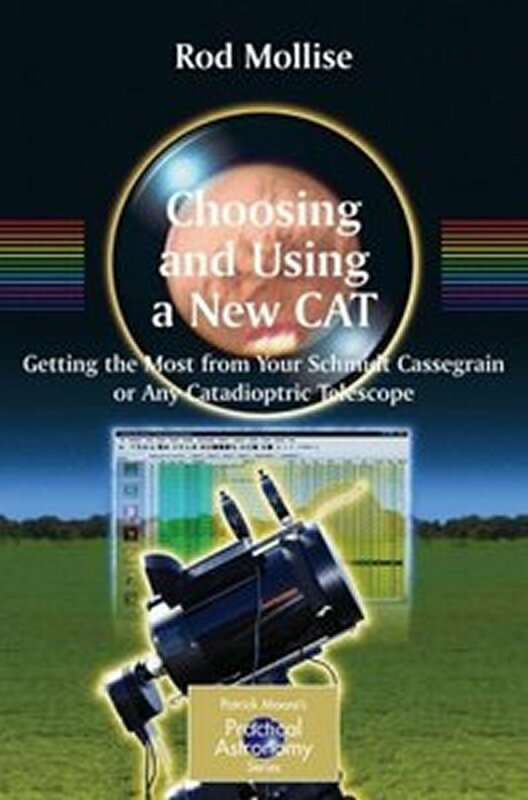 There is some material on general subjects like observing the Solar System and the deep sky, but I tried mightily to keep it SCT-centric, unlike the book’s competition, The 20cm Schmidt Cassegrain (2000). Of course, if that otherwise good book had stuck to the subject of SCTs more closely, I probably wouldn’t have felt moved to write Choosing and Using a Schmidt Cassegrain in the first place, and wouldn’t be telling you about its successor. I wrote this one for a reason, too. Plenty of new amateurs are enthusiastic about the deep sky, but live where they can’t see it. Or they think they can’t. The purpose of Urban Astronomer was and is to educate newbies and old hands both about what can be seen from the worst light pollution and how to see it. I don’t mind saying I think the book does a pretty good job of that. Can I share a fantasy with you-all? I’m sitting around Chaos Manor South one evening, minding my own bidness when the phone rings. It’s a BIG HOLLYWOOD PRODUCER. He wants to turn Urban Astronomer into a ROMANTIC COMEDY about an amateur astronomer (Hugh Grant) wrongly accused of using his scope to peer in the bedroom window of The Girl Next Door (Drew Barrymore). Hilarity and romance ensues. Mr. Producer offers me a few million. I live happily ever after. Well, I can dream cain’t I? Next Time: I'm going to be a little busy tomorrow, Sunday, and I hope to get out with a telescope for a while tonight (though it will probably not be good enough for me to pursue the Herschel Project), so I figgered better early than late, muchachos. Anyhow, next time around we will probably take up the ubiquitous Atlas/EQ-6, Unk's fave bargain basement telescope mount.